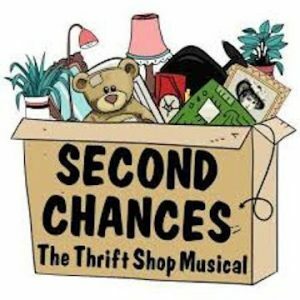 Second Chances: The Thrift Shop Musical is on the main stage at Broadway Palm Dinner Theatre through May 12. 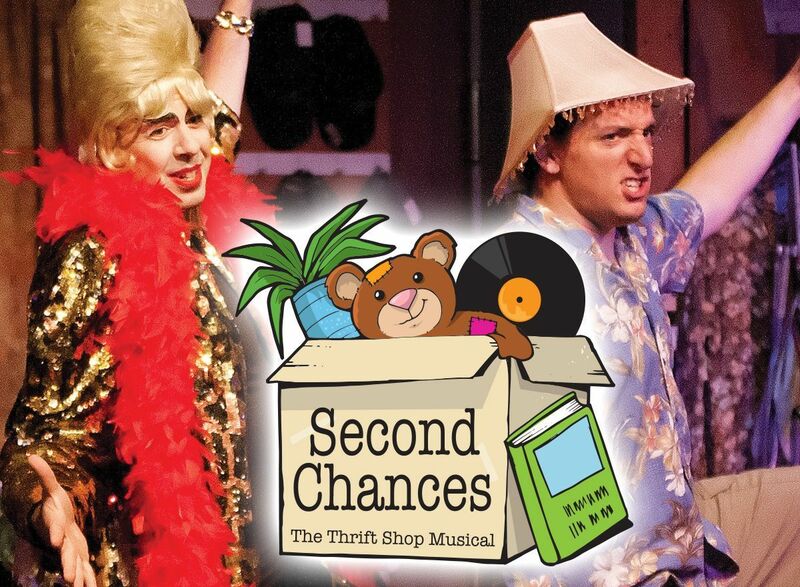 It’s a funny, yet inspirational, musical comedy about the quirky characters that run The Second Chances Thrift Shop. You’ll meet the hilarious lead clerk who always brings sunshine to the day with humor, the couple who work in the collection area and discover that you can find love later in life, the young mother and new shop manager trying to start over, and more! 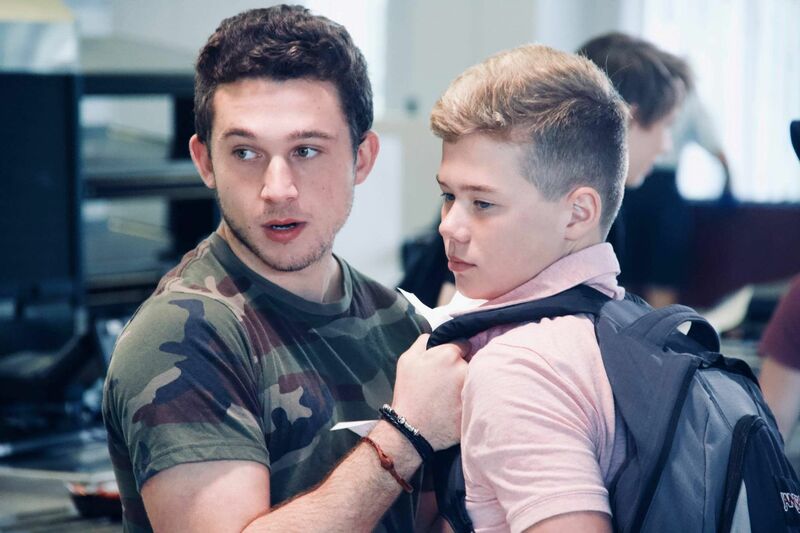 When the greedy landlor threatens to sell the thrift shop, the team won’t stand for it. Spend a year with the loveable, yet quirky, group and see how they band together to save the shop and in the process, discover it’s not just old treasures that are getting Second Chances! The show is the brainchild of Broadway Palm co-founder Tom Prather. He started working on the project in earnest early in 2015, and by that summer, the script was done. 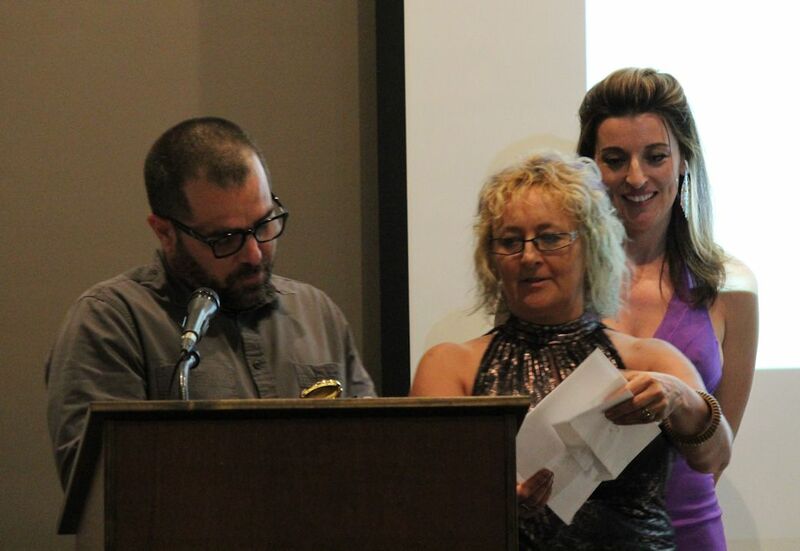 The songs came from Broadway Palm regulars Chris Russell (music) and Megan Orlowski (lyrics). Musical styles include a rock/soul number, some standard musical-theater songs, a 1920’s soft shoe featuring a drag queen, a rap song about the thrift shop’s rules, and a ukulele song called “If Our Love Is Gone.” There’s even a reference to the Macklemore & Ryan Lewis hit “Thrift Shop” in one of the songs. According to Prather, the thrift shop is a metaphor for people opening a new chapter in their lives. Every character in the show is getting a second chance at life in one way or another. The show’s characters were partly inspired by the people Prather met at the Iona-Hope Episcopal Church thrift shop. 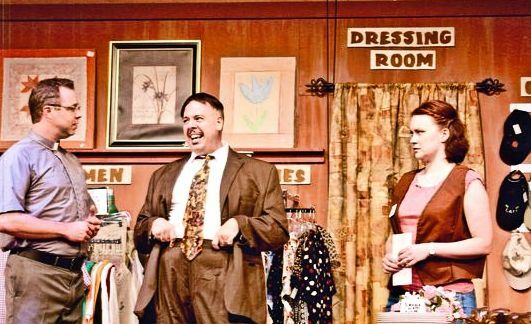 He volunteered at the south Fort Myers shop every Wednesday when he wasn’t in Arizona or working at Broadway Palm’s sister theater in Lancaster, Pennsylvania, The Dutch Apple Dinner Theatre. As he worked putting tags on items, hanging clothes and doing whatever else needed to be done, he picked up lines and material from the employees and shoppers filing through the store – although none of the characters in the show are either real or autobiographical. 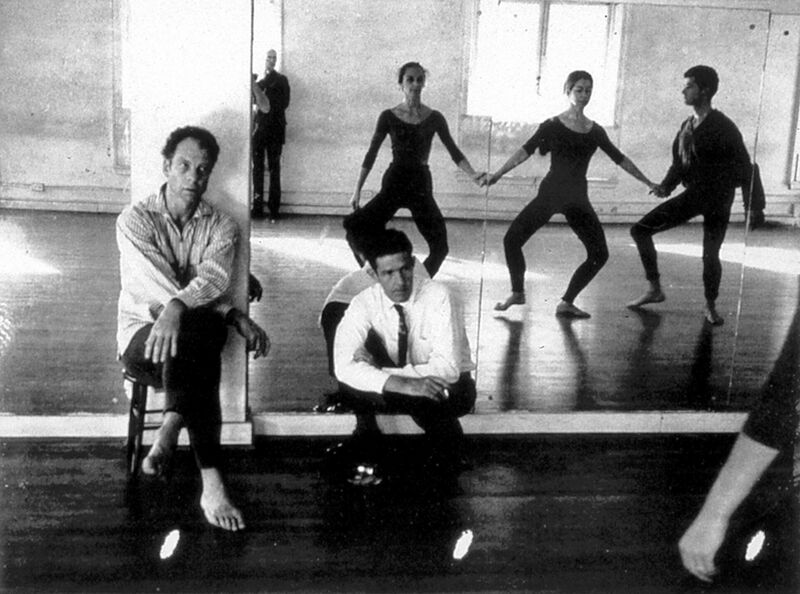 To the contrary, Prather developed the characters with specific Broadway Palm actors in mind. 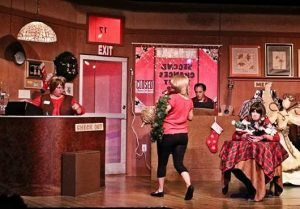 After premiering in the Off Broadway Palm in 2015, the musical enjoyed a limited engagement in May of 2016 at the Sugden Community Theatre on a bigger stage, which necessitated some editing, revisions, shorter scene changes and new music. 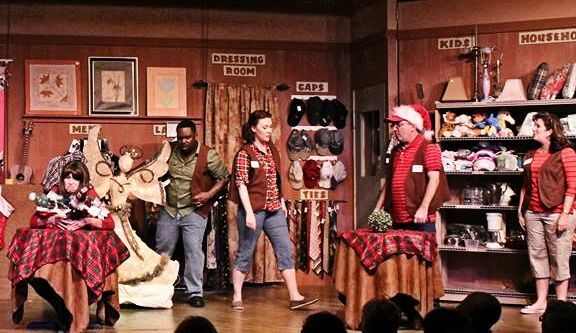 The show was then performed at The Dutch Apple Dinner Theatre in 2017. With its return to Broadway Palm’s main stage, this beloved show has now come full circle. 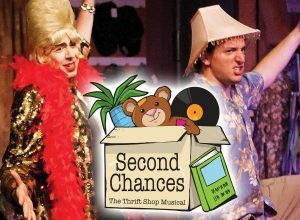 Second Chances runs April 4 through May 12. 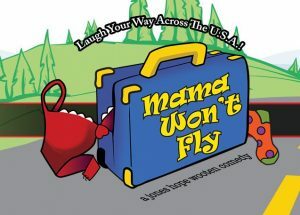 The Off Broadway Palm Theatre is presenting Mama Won’t Fly now through April 28, 2019. Laugh your way across the USA with this ferociously funny comedy by the writers of The Savannah Sipping Society and The Hallelujah Girls. A race against the clock begins when Savannah Sprunt Fairchild Honeycutt agrees to get her feisty mother all the way from Alabama to California in time for her brother’s wedding. Savannah’s problem: MAMA WON’T FLY. With only four days to make it to the ceremony, this determined daughter has no choice but to drive cross-country with her equally willful mother, Norleen Sprunt, in Mama’s vintage sedan. As Savannah steels herself for this hastily conceived road trip, another outrageous complication arises: the bubbly, over-eager bride-to-be arrives unannounced. Delighted to finally meet her future in-laws, Hayley Quinn is convinced that travelling together to her wedding is the perfect way to bond. The folly of her decision quickly becomes apparent when the journey begins and comedic chaos ensues. The rest of this advance is here. 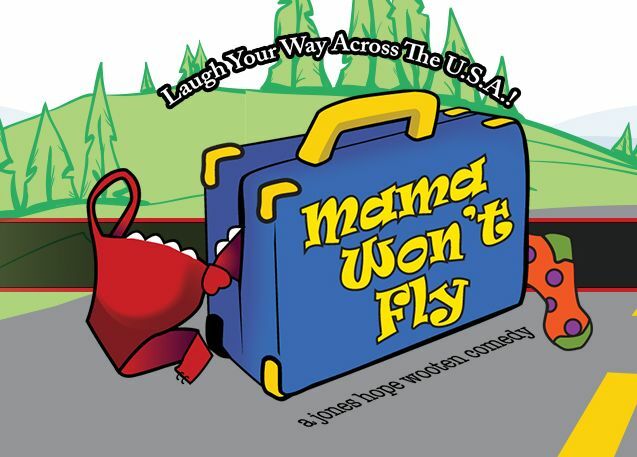 On stage through April 28 in the Off-Broadway Palm is Mama Won’t Fly, a female road trip comedy by the writers of The Savannah Sipping Society and The Hallelujah Girls. So here’s what’s going on. Mama’s son is getting married on a beach in sunny California. Mama and her daughter, Savannah, live in Alabama (roll Tide!) but, to Savannah’s shock and consternation, Mama won’t get on the Boeing 737 Max (okay, I ad libbed this one) that Savannah’s booked seats on and insists they’ll have to drive to California in her vintage and recently-repaired Buick sedan. At the last minute, Mama’s soon-to-be daughter-in-law/Savannah’s soon-to-be sister-in-law, Hayley, shows up to accompany her new in-laws to the wedding. And the road trip from hell is on. There’s no getting around the fact that the premise and script for this show are highly contrived. Most of the unscheduled stops that Mama, Savannah and Hayley make en route to the latter’s nuptials test the bounds of credulity, but hey, Mama Won’t Fly is a farce in the tradition of The Lucille Ball Show, National Lampoon Vacation and Little Miss Sunshine. 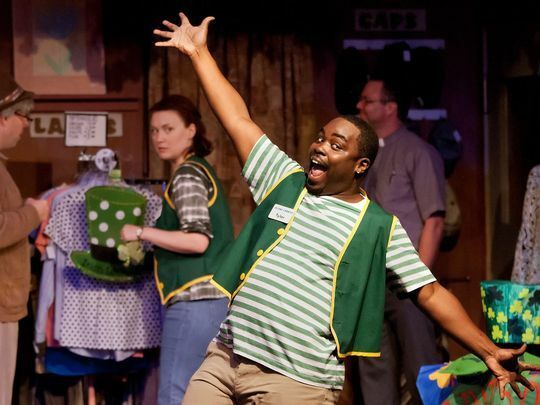 But even if you’re not a fan of the farce, there’s more than ridiculous situational comedy, a trunkful of lame laughs and the cozy confines of the Off Broadway theater to warrant an afternoon or evening of your time. 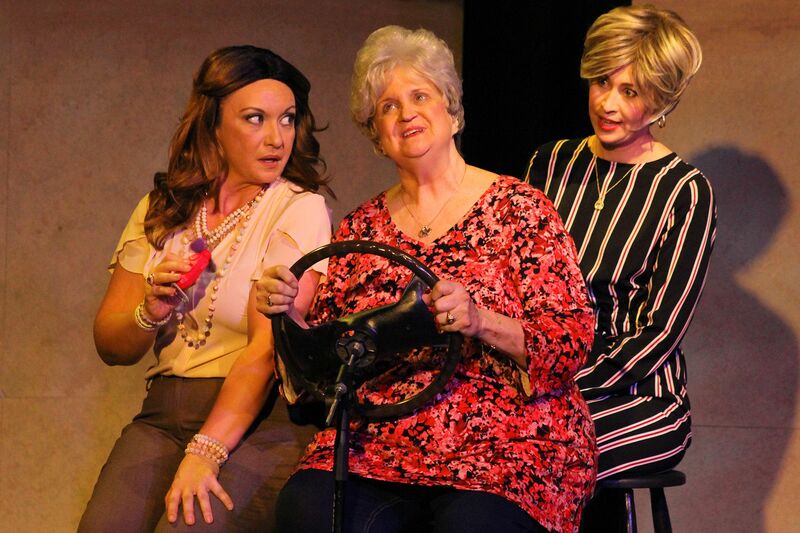 Such as the performances of Dena Galyean as Savannah Sprunt Fairchild Honeycutt, Donna Schulte as Mama Norleen Sprunt and Katie Pankow as Haley Quinn. Please go here for the rest of this review. The incomparable Dena Galyean is Savannah Sprunt Fairchild Honeycutt in Mama Won’t Fly. This beleaguered character must contend with a cantankerous mom and her maddingly bubbly soon-to-be sister-in-law as they race across the country for Haley’s impending nuptials, overcoming one inconceivable mishap after another. Dena Galyean is one of the hardest working thespians in all of Southwest Florida. And she always seems to land fascinating roles. Among her most recent – and memorable – are Susan B. Anthony in Theatre Conspiracy’s production of The Agitators, Nora Helmer in Henrik Ibsen’s A Doll House (also for Theatre Conspiracy) and Stella Kowalski in The Studio Players’ production of Tennessee William’s A Streetcar Named Desire at the Golden Gate Community Center. Read here for the rest of Dena’s profile. 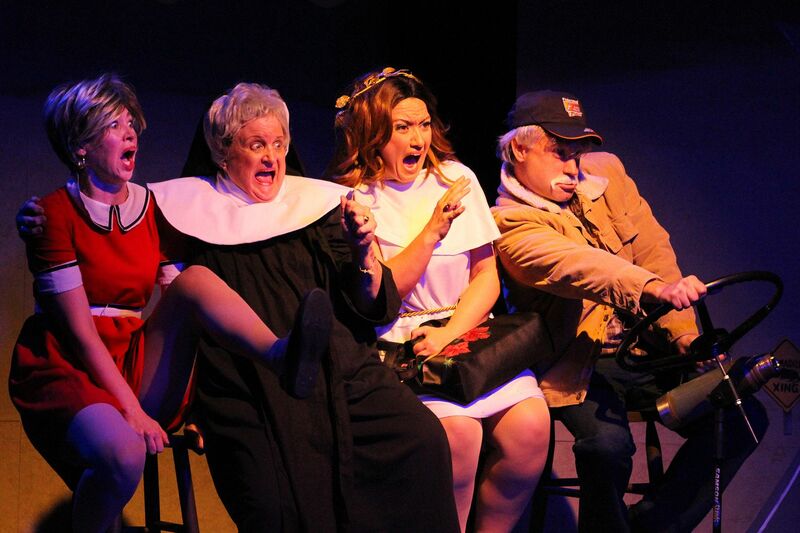 Katie Pankow stars in Off Broadway Palm’s production of the hysterical comedy Mama Won’t Fly. 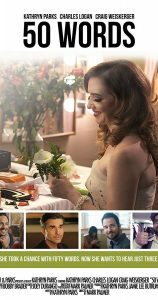 She plays bride-to-be Hayley Quinn, who makes the questionable decision to meet her future in-laws by driving across country with her future mother and sister-in-law but anything that can go wrong does go wrong, and more. 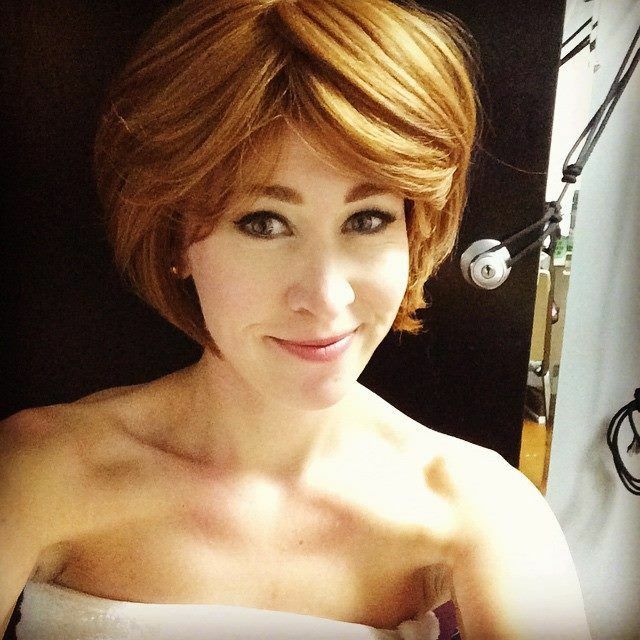 Katie Pankow is a talented actor who frequently performs locally. Her acting credits include Grounded and Swell Party for Theatre Conspiracy at the Alliance for the Arts, and Mrs. Cratchit in A Christmas Carol (December, 2018 at the Hippodrome State Theatre), Poppy Norton-Taylor in Noises Off (January 12-February 17, 2018), Belle (along with Mrs. Fezziwig, Martha Cratchit and many others ) in A Christmas Carol (December 8-29, 2017) …. Read here for the rest of Katie’s profile. Broadway Palm is holding open children’s auditions for their upcoming production of Beauty and the Beast at 10:00 a.m. on Saturday, April 27, 2019 at the theater, which is located in the Royal Palm Square at 1380 Colonial Boulevard in Fort Myers. Auditions are on a first-come, first-served basis. A sign-up sheet will be available at 9:30 a.m., but no appointments will be taken. 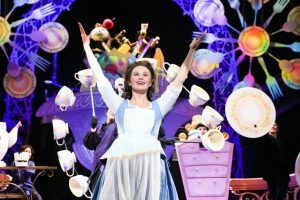 The theater is casting for a young male actor to play Chip, the enchanted tea cup/son of Mrs. Potts, who is innocent, playful and bright-eyed. Vocal range: A3 – F5. Must be UNDER 4’10”. The role will be double cast and children will alternate performances. Anyone interested must be available for the rehearsal process and all alternated, assigned performances. Rehearsals take two weeks, running June 6 through June 19, 2019. The show opens June 20 and runs through August 10, 2019. Performances are Wednesday through Sunday evenings with selected matinees on Wednesday, Thursday, Friday, Saturday or Sunday. The full performance schedule is available at www.BroadwayPalm.com. For more information, visit www.BroadwayPalm.com or call (239) 278-4422. Broadway’s rock ‘n’ roll sensation Million Dollar Quartet is at Florida Rep. through April 21. The musical reprises a jam session that made music history in 1956. It occurred when Memphis record producer Sam Phillips brought four of his newest clients together to make music. That fab four consisted of Carl Perkins, Jerry Lee Lewis, Johnny Cash and Elvis Presley. Million Dollar Quartet took Broadway by storm and provides an electrifying glimpse of the four legends before they became rock ‘n’ roll icons. The musical features over twenty rock ‘n’ roll hits, including “Blue Suede Shoes,” “Hound Dog,” “Sixteen Tons,” “Great Balls of Fire” and many more! Florida Rep has assembled an A-list cast for the musical. Several of them are playing their roles for a fifth, sixth, and even the tenth time. Florida Rep ensemble member Brendan Powers (Hay Fever) returns this season as record producer Sam Phillips and is joined by Joe Boover as Elvis (Florida Rep debut), Gregg Hammer as Johnny Cash (Florida Rep debut), Jeremy Sevelovitz as Carl Perkins (Florida Rep debut), and Brady Wease as Jerry Lee Lewis (Shear Madness). 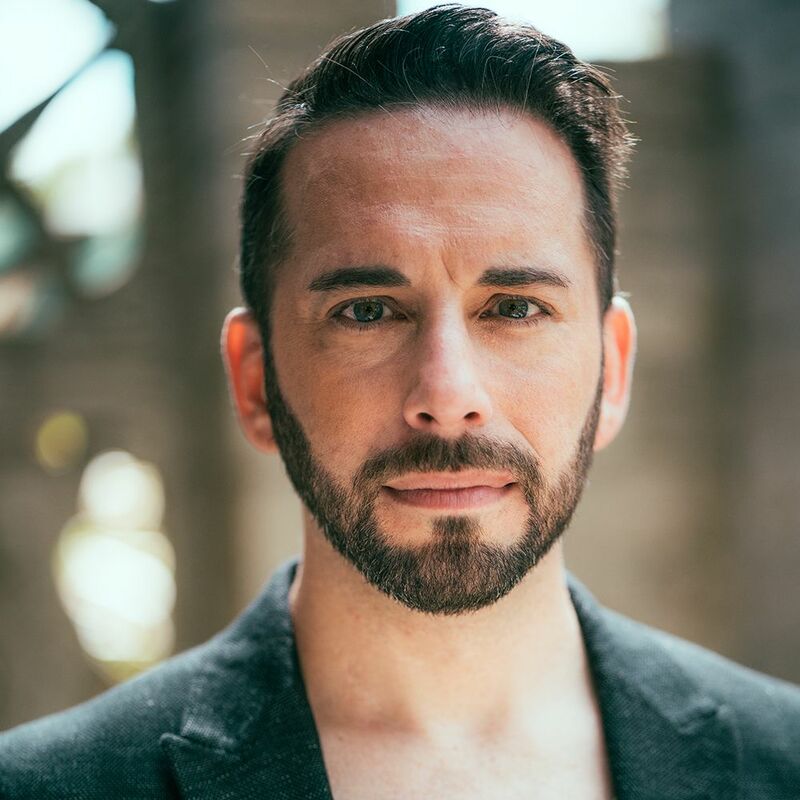 Also joining the cast are Julie Kavanagh as Dyanne (Too Marvelous for Words), Daniel Bailey playing bass (Florida Rep debut) and David Sonneborn on drums (Florida Rep debut). Associate Artistic Director and ensemble member, Jason Parrish (The 25th Annual Putnam County Spelling Bee) directs, and is joined by Resident Set Designer Jordan Moore (Cabaret), ensemble Costume Designer Stephanie Genda (Cabaret), Lighting Designer Julie Duro (Twelve Angry Men), Sound Designer Katie Lowe (Damascus), Music Director David Sonneborn (Florida Rep debut) and Stage Manager Kathleen Barrett (Florida Rep debut). Tickets are priced at $59 and $53 for regular performances but go up to $65 and $59 on March 12. Preview tickets are $35 and $29 and are selling out for the March 19-21 performances. A limited number of $25 Two-Day-Deal tickets are available 48-hours in advance of each performance by calling the box office at 239-332-4488. 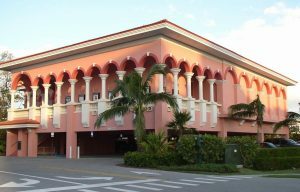 Box office hours are Monday through Friday, 10:00 a.m. to 5:00 p.m. New this season, Florida Rep’s parking lot will open 2 hours before each performance and offers guests limited free parking across the street from the Arcade Theatre. Mack is Back! The Music of Bobby Darin comes to Blackburn Hall on May 21 & May 22. 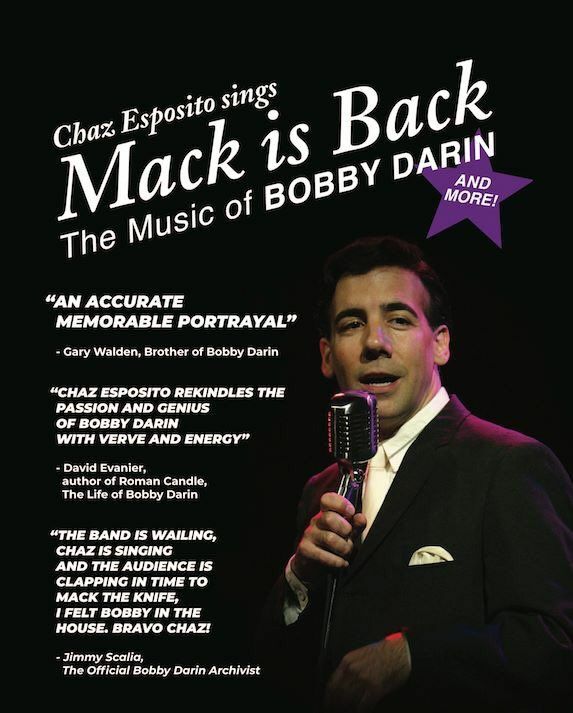 In this two-night extravaganza, Chaz Esposito performs the musical repertoire of the beloved singer and songwriter in his hit tribute Mack is Back! The Music of Bobby Darin. 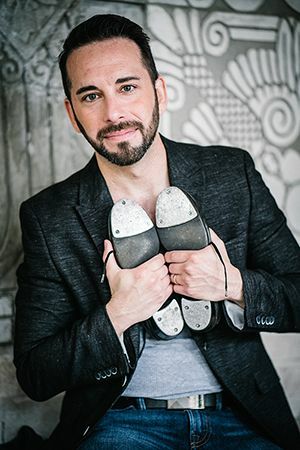 Movin’- and- a-groovin’, rockin’- and- a- rollin,’ this musical special will have you snapping your fingers, clapping your hands, and singing along to musical hits like “Beyond the Sea,” “Splish Splash,” “Mack The Knife,” and more. 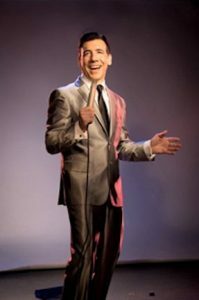 Chaz toured extensively playing the role of Bobby Darin in the Off-Broadway production of Mack the Knife…The Life and Music of Bobby Darin. After performing hundreds of shows and concerts throughout the years, he was granted permission from and received the endorsement of The Bobby Darin Estate to play Darin and his music. Esposito entered the entertainment business over 30 years ago as a teenager. He has also been seen in national commercials, theatre, and corporate videos across the country. In addition, his production company is one of the Off-Broadway producers for the musical production of Mack the Knife…The Life and Music of Bobby Darin. 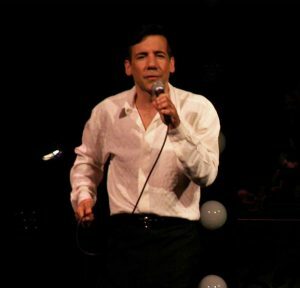 “Chaz is an accurate and memorable portrayal,” shares Bobby Darin’s brother, Gary Walden . 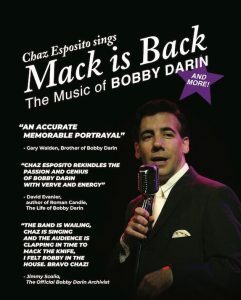 “Chaz Esposito rekindles the passion and genius of Bobby Darin with verve and energy, “ adds David Evanier, the author of The Roman Candle: The Life of Bobby Darin. Tickets for Mack is Back! 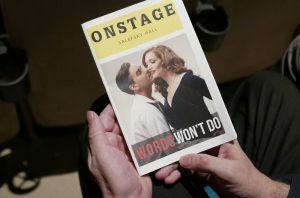 are $40 and available from The Naples Players Box Office at (239) 263-7990 or online: NaplesPlayers.org. 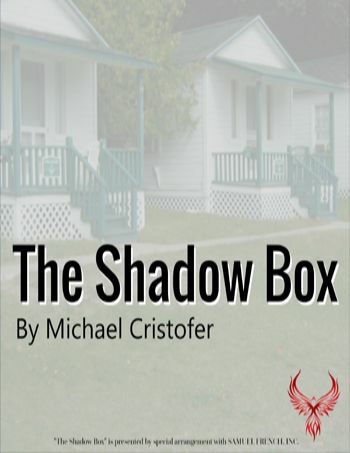 The Shadow Box by Michael Cristofer opens May 2 at New Phoenix Theatre on McGregor Boulevard. In this compelling dramatic triptych, three terminal cancer patients dwell in separate cottages on a hospital’s grounds, attended and visited by family and close friends. 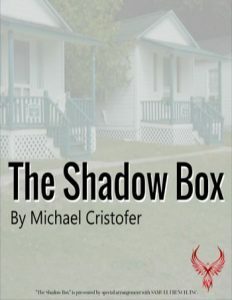 Although the characters are either living in or visiting a hospice for the terminally ill, The Shadow Box is not about death and dying as much as it is about self-realization. 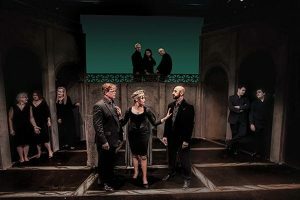 That’s because to playwright Michael Cristofer’s way of thinking, it is necessary to have an awareness of mortality in order to understand ourselves and how we live. To explicate this theme, Cristofer focuses on the lives and families of three people who are living with the certainty that their diseases will kill them within a short time. They are forced to evaluate themselves and come to a conclusion about the manner of their existence. There’s Agnes and her mother Felicity. They’re not only estranged by Felicity’s anger and bitterness over the reality of her impending demise, but by Felicity’s dementia. 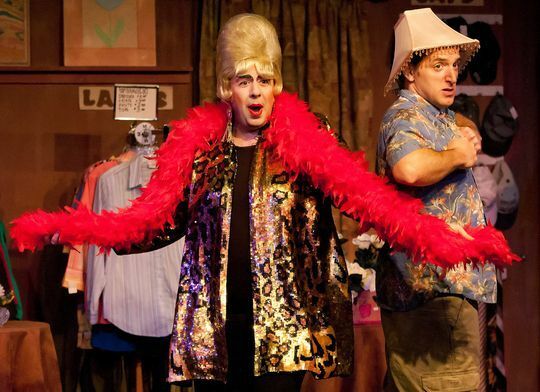 There’s garrulous Brian and Beverly, whose marital complications are exacerbated by Brian’s new lover, Mark. And there’s Joe and his anxious, heartbroken wife, Maggie, who finally finds the support she needs from her husband and their teenage son, Steve. What comes out from the interactions of these three groups of people is the unerring message that the more honest they are, the more openly they can express their love for one another and the more genuine and immediate their relationships can be. It’s only in this way that it becomes easier for the dying to let go of life. 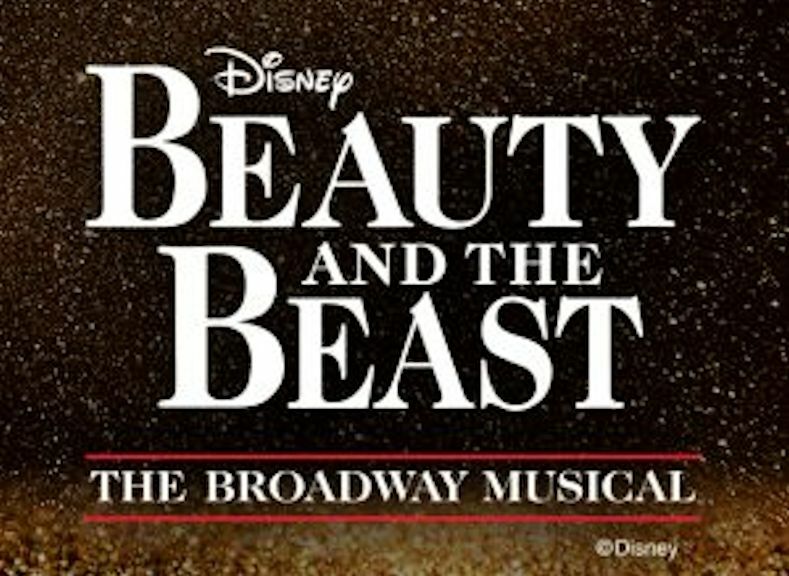 Performances are at 8:00 p.m. on May 2, 3, 4, 9, 10, 11, 16, 17 and 18, with 2:00 p.m. matinees on May 5, 12 and 19. 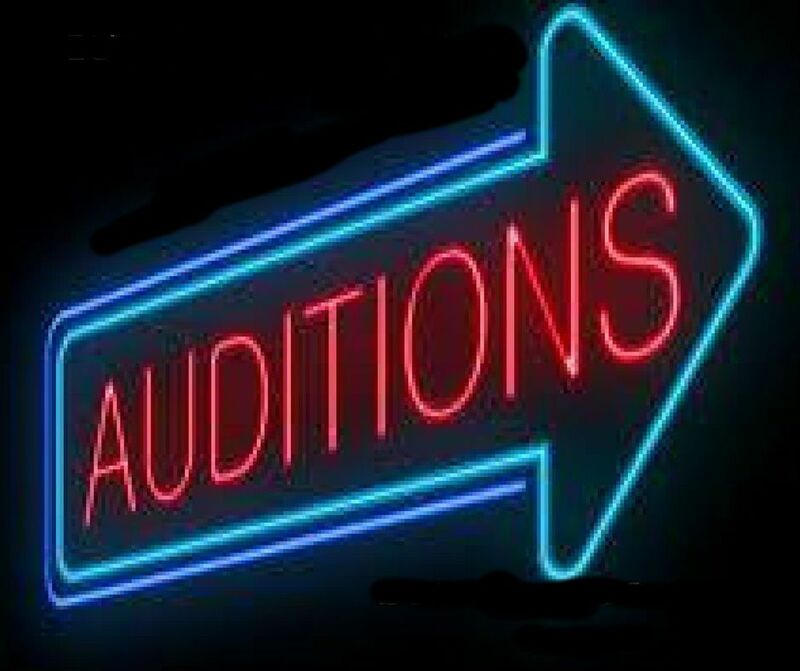 New Phoenix Theatre will be holding auditions for Rumors on Saturday, April 27th from 2:30 to 5:30 at the theater. 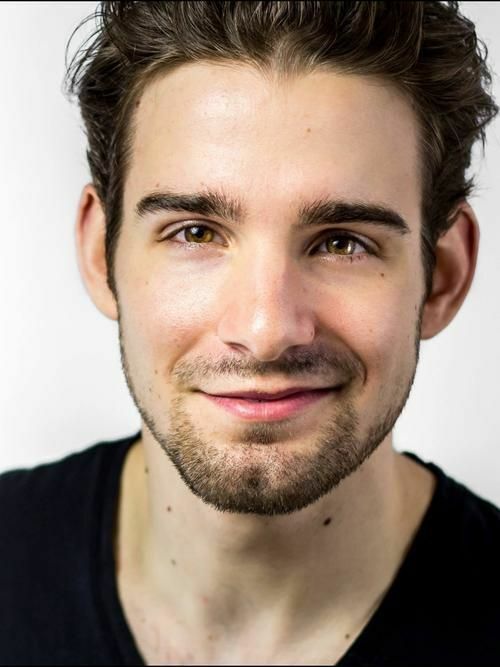 Scott Carpenter will direct the production. Rumors is a madcap, slamming door farce set in 1988 in a large home located just outside of New York. The characters are arriving as guests at a 10th anniversary dinner. The ﬁrst couple to arrive discovers that one of their hosts (Charley) has apparently attempted suicide…unsuccessfully. Charley’s wife, Myra, is nowhere to be found and neither are the servants. Through the course of the show, the audience never meets Charley or Myra. As more guests arrive, there are cover-ups, deceptions, mistaken identities and huge laughs. Chris Gorman (F) – Chris is an attractive woman. She is nervous and neurotic. She recently quit smoking but quickly falls off the wagon. (This part involves some physical comedy). 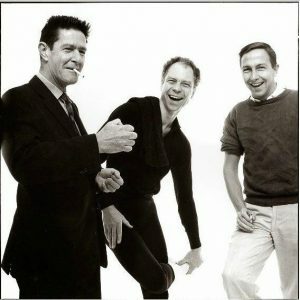 Ken Gorman (M) – Ken is Chris’ husband. He is Charley’s attorney and friend. Ken is pompous, serious, a know-it-all. 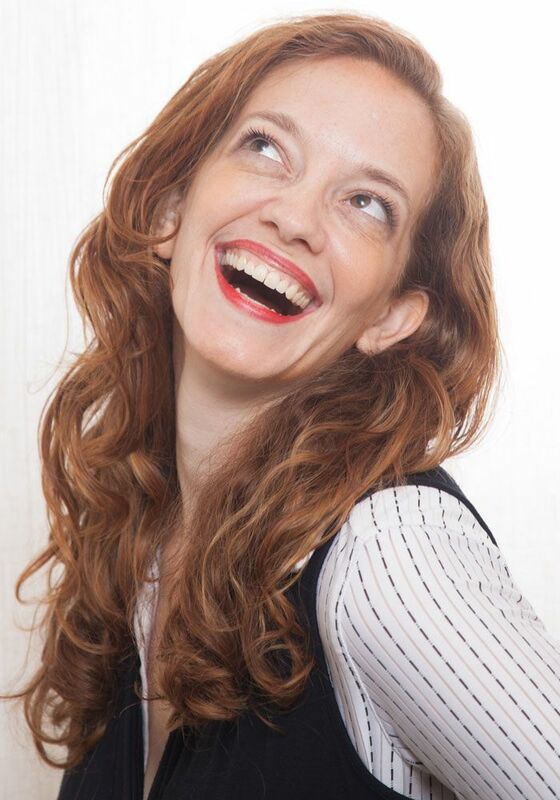 Claire Ganz (F) – Claire is an unimpressed smart mouth who is seemingly amused by everything that is going on – which is not surprising considering her husband. 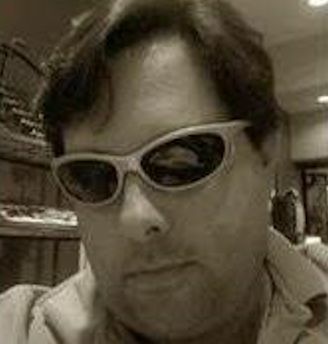 Leonard “Lenny” Ganz (M) – Lenny is Claire’s husband and is Charley’s accountant. Lenny is by far the most foul-mouthed, outspoken member of the cast. He is also HILARIOUS (has a 3 page monologue). Cookie Cusack (F) – Cookie is a host of her own cooking show, in her mid to late 40s, garish, a bit ditzy and will be expected to deliver quite a bit of physical comedy. 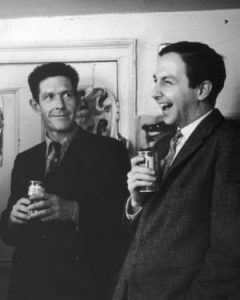 Ernie Cusack (M) – Ernie is Cookie’s husband and Charley’s analyst. He is a somewhat quiet and calming presence in the midst of the storm of confusion. Glenn Cooper (M) – Glenn is a candidate for the State Senate. He is quite handsome. The TV cameras love him. He is constantly worried about his image. Cassie Cooper (F) – Cassie is Glenn’s wife, very good looking, and totally nuts. She and Glenn hate each other. She doesn’t want to be there, she is constantly fighting with Glenn and she is constantly threatening divorce. Officer Ben Welch (M) – No nonsense cop. Has a couple of smaller monologues. Officer Connie Pudney (F) – Welch’s police partner (Minimal lines). 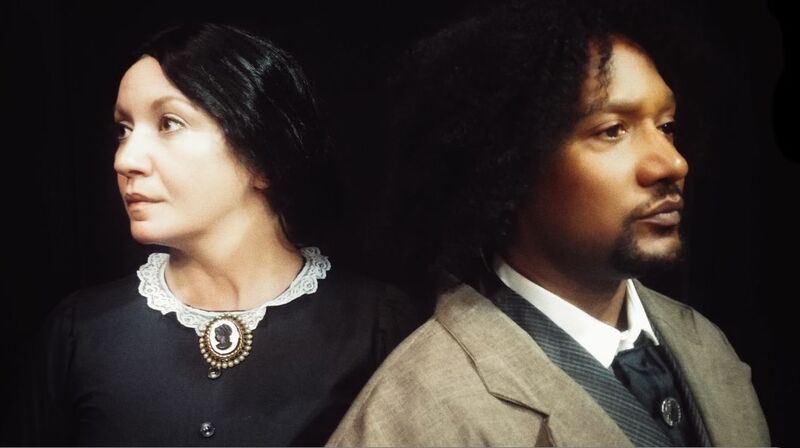 Performance dates are June 13, 14, 15, 20, 21, 22, 27, 28, 29 at 8:00 p.m. with 2:00 p.m. matinees on June 16, 23 and 30. Rehearsals begin May 6. 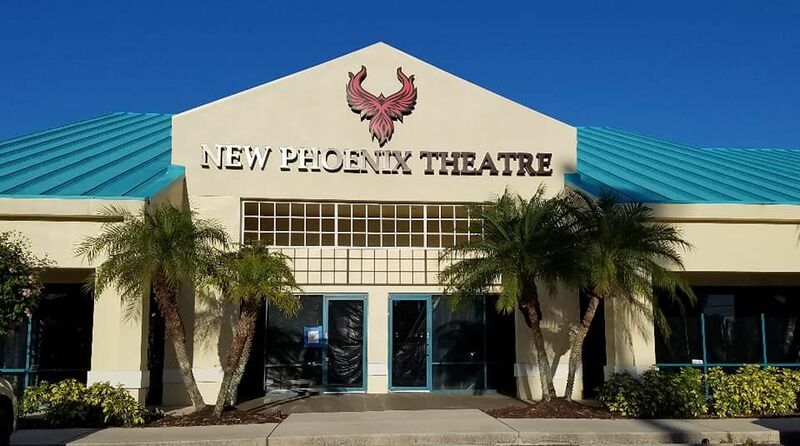 The Naples Players’ (TNP) Readers Theatre is now accepting original one-act scripts for its 16th Annual “An Evening of New Plays” contest for Southwest Florida playwrights. Winners will have the opportunity for their plays to be cast, directed, and staged at one of the most highly-rated theatres in the country. 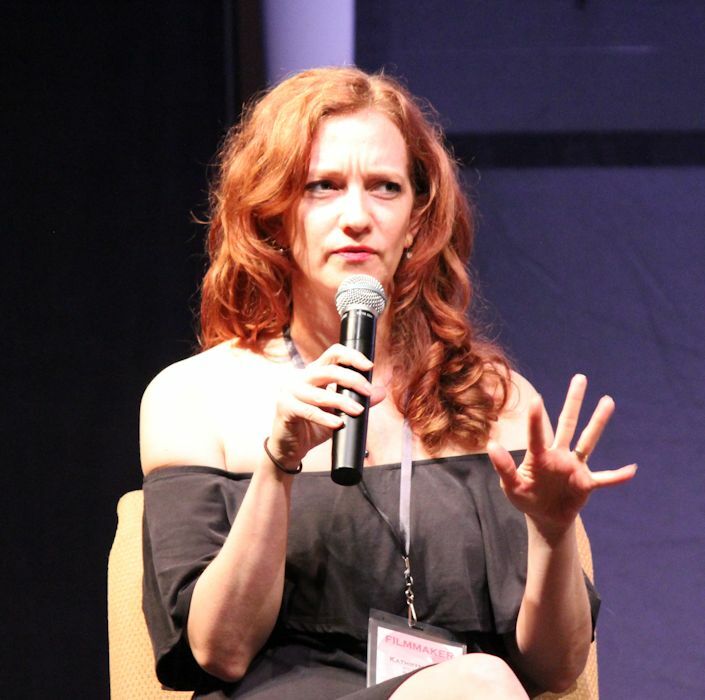 “It’s a fantastic opportunity for talented playwrights to get their work in front of an audience,” observes Jessica Walck, Associate Artistic Director. 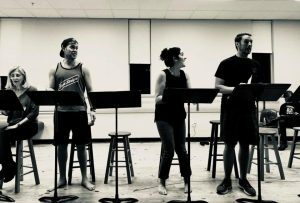 Readers Theatre is devoted to developing playwrights, directors and actors through staged readings of original works as well as fresh and inventive one-acts. The Readers Theatre program allows The Naples Players to test new plays before producing them and provides critical feedback to playwrights, along with access to performance and directing opportunities through flexible and shortened rehearsal processes and augmented performance demands. 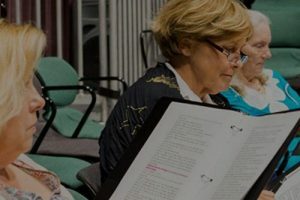 Both veteran and novice actors, directors, and playwrights can call Readers Theatre home, and this flexibility helps Readers Theatre remain as one of the foundational programs of The Naples Players. may have been entered in an earlier contest, so long as it was not an earlier finalist. Once the play is submitted, no script changes can be made for purposes of this competition. To submit a play, playwrights must submit three copies of their script in standard stage play format to: “An Evening of New Plays 2018,” The Naples Players, 701 5th Avenue South, Naples, FL 34102. Plays may also be submitted electronically to: tnpreaderstheatre@gmail.com. A title page with the name of the play, synopsis, and list of characters must be attached to each script. Include a separate page, unattached to the script, with the name of the play, playwright and contact information. This is to help assure anonymity during the judging process. For scripts to be returned, please include a self-addressed stamped envelope. 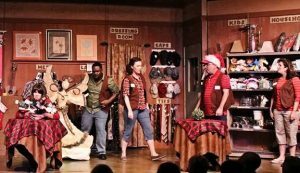 The judging panel may recommend up to four finalists to the Readers Theatre Committee for review and final approval by Associate Artistic Director Jessica Walck. 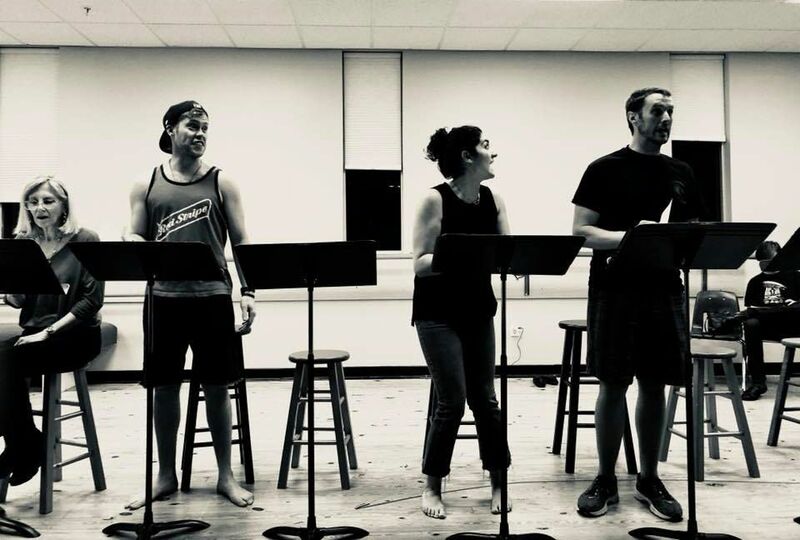 Authors retain all rights and give performance rights to The Naples Players for “An Evening of New Plays” and limited readings in other venues, including possible outreach and electronic media. Deadline for submission is July 31, 2019 and winnerswill be notified by October 31, 2019. Readers Theatre is The Naples Players’ affiliate theatre group, led by TNP’s Associate Artistic Director Jessica Walck. 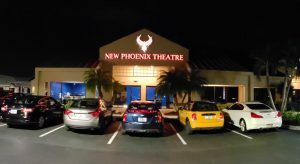 Performances are held throughout the year in the intimate 100-seat Tobye Studio Theatre at the Sugden Community Theatre in the center of 5th Avenue South, Naples. Readers Theatre perform a series of one-act plays and full-length works with scripts in hand and without props or costumes. Readers Theatre performances focus on the written word. The Naples Players (TNP) Sugden Community Theatre is Naples’ oldest and premier theatre group and a vital part of the exciting experience of Downtown Naples. Celebrating its 66th season, and as one of the top theatres in the country, they offer a variety of plays and musicals in three intimate spaces, Blackburn Hall, the Tobye Studio Theatre and outside BakerStage – all located in one building on Fifth Avenue South. The Fort Myers Beach Film Festival is back for its 13th year, attracting independent film fans, filmmakers, and distributors to spend five fabulous days and nights on the Gulf beaches of Fort Myers Beach, Florida. Attendees come from all over the world to exchange ideas, make new contacts, and enjoy some compelling and interesting films encompassing a wide range of tastes. This year’s festival runs from April 24 – 28 with events for all ages. 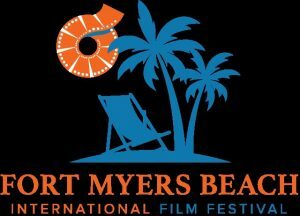 The festival’s opening ceremony takes place in the Beach Theater at 6425 Estero Boulevard at 2:00 p.m. on Wednesday, April 24. One of the short films being screened this year by the Fort Myers Beach International Film Festival is Bird’s Eye. A spellbinding 13-minute drama, Bird’s Eye tells the story of a rigid music professor who loses her sight only to find perfect clarity in an unexpected place – within the walls of an at-risk urban high school. Scott Poiley directs. The film was written and produced by Erin Beute, who stars in the film as music instructor/composer Dr. McAllister as well. We meet Dr. McAllister as she labors at the piano, fitfully trying to piece together fragmented notes and bars into a magnum opus. Try as she might, the work remains out of reach. The harder she pushes, the more it evades her. McAllister is angry, bitter and surly … as one of her hapless students discovers to her chagrin when she interrupts McAllister to ask why the good doctor gave her a failing grade on a recent assignment. The poor girl’s timing couldn’t be worse. She becomes the object of McAllisters pent-up frustration at her own inability to achieve the perfection she demands of herself. As the student watches with growing despair, McAllister literally tears her student’s composition to pieces, eviscerating the poor girl one painful stanza at a time. In the middle of the tirade, a droplet of blood cascades onto the redletter failing grade on the sheet music in McAllister’s hand. In the next instant, McAllister suffers a massive diabetic retinal hemorrhage that robs her of nearly all her sight, sweeping away with it McAllister’s identity—her place in the world disappearing as quickly as her eyesight. Dr. McAllister’s grief and isolation render her even more emotionally impenetrable than before until one afternoon, a year later, she’s thrust against her will into a classroom at St. Matthew’s Academy with a group of at-risk students she does not want to teach. As she virtually hides behind the piano that sits in front of the room, one of the students steps forward to share a rap song he’s recently written. Involuntarily, McAllister’s fingers glide across the keys, echoing, then amplifying his notes and refrains. As the rapper and the other students look on in amazement, a torrent of musical creativity comes pouring out. Unblocked at last, McAllister begins creating music like she never has before. Together, McAllister and her new students step falteringly into new possibility and purpose – beyond boundary and circumstance – no matter the consequences – winding up at a singing competition where they nervously wait in the wings as the group on stage brings down the house with incredible harmony, intonation and tonality. “It’s going to be fine,” McAllister reassures her students. “Just sing for them the way you’ve sung it for me, that’s all I can ask,” she adds as they make their way center stage. “In every hero’s journey, [the hero] must [ultimately] slay the dragon,” observes Poiley who, like Dr. McAllister, had to overcome severe physical challenges that threatened to derail his own creative elan. And while that’s where the short ends, it may also be the beginning of a longer and larger journey not only for Dr. McAllister and her students, but for Beute and Poiley as well. That’s because Beute and her cohorts have plans to turn the short drama into a full-length film provided they can find the funding for such an ambitious project. There’s much in this quasi 13-minute trailer to commend it to a full-length production. The short’s opening sequence is forceful, electrifying and gripping just like the opening four notes of Beethoven’s 5th. And just like the second greatest composer’s magnum opus, the opening of Bird’s Eye is also much more complex and multi-layered than we initially realize. It sets the stage for the staggering, tumultuous rhythms and interrelationships that follow, permeating and developing the film’s opening themes. 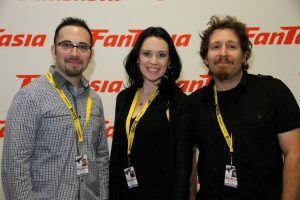 The rest of the film’s ethnically diverse cast (which includes Joshua Brockington as Divante, Samuel Hunter as Jakim, Nayshka Miranda as the besieged music student and Leslie Maine as Trish) matches the high standard set by the picture’s leading lady and screenwriter. 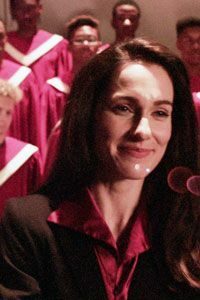 Several enjoy terrific singing voices, which contribute to the overall quality of the music included in the film. Featuring original music and an inspiring story of darkest night giving light to a higher purpose that transcends boundary, disability and circumstance, Bird’s Eye illustrates the transformative power of music. More, Bird’s Eye is a lyrical ode to the human spirit and the upper reaches of creativity that can be unleashed when self-absorbed egocentricity blindly pursuing perfection is replaced by the spirit of collaboration exerted by a group of diverse and damaged individuals striving to achieve a higher purpose. 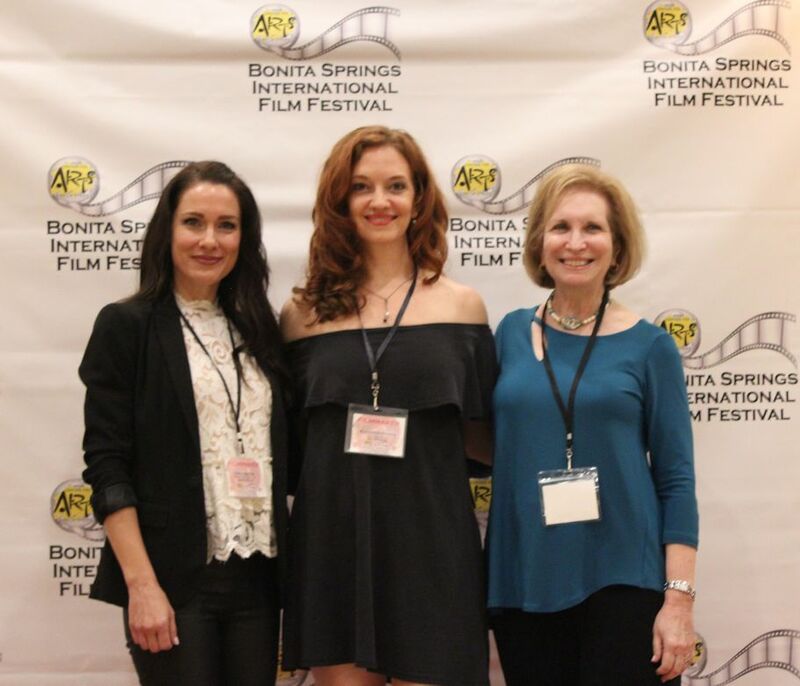 The film recently won Best Florida Film at Tally Shorts and Best Short Narrative at the Bonita Springs International Film Festival. It screens during the Fort Myers Film Festival in the Sidney & Berne Davis Art Center during the 2:15 shorts block on Friday, April 12. One of the short films being screened this year by the Fort Myers Beach International Film Festival is Bird’s Eye. The 13-minute drama titled Bird’s Eye is directed by Scott Poiley and written by and starring Erin Beute. Erin Beute is a SAG/AFTRA actor known for The Vampire Diaries (2009), Outcast (2016) and Shots Fired (2017). 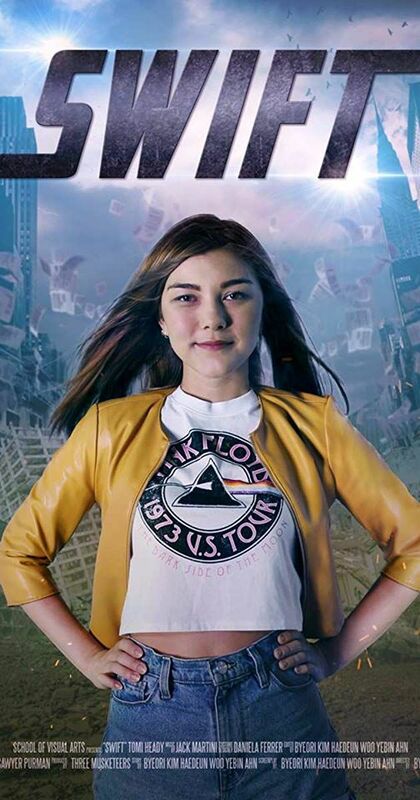 Her film credits include leads in Tooth Fairy 2, If Only, The Five Stages and The Bell and supporting roles in Waves of Grace, Ring of Fire and The Whisper Home. 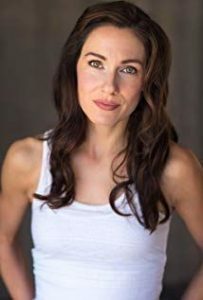 In addition to The Vampire Diaries, her television work includes guest star appearances in Drop Dead Diva, Last Stop (Pilot) and Coma, and co-starring roles in Charlie’s Angels, Magic City, Burn Notice and The Glades. 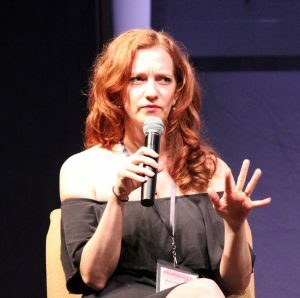 Erin has also done live theater, playing, among other roles, the first witch in Macbeth, Annie Sullivan in The Miracle Worker, the Evil Queen in Snow White, Irene Molloy in The Matchmaker and Doris Walker in Miracle on 34th Street. Beute has a B.A. in Music/Theatre from Cornerstone University Conservatory. And with Bird’s Eye, Erin adds screenwriter to her long list of impressive achievements in the performing arts. 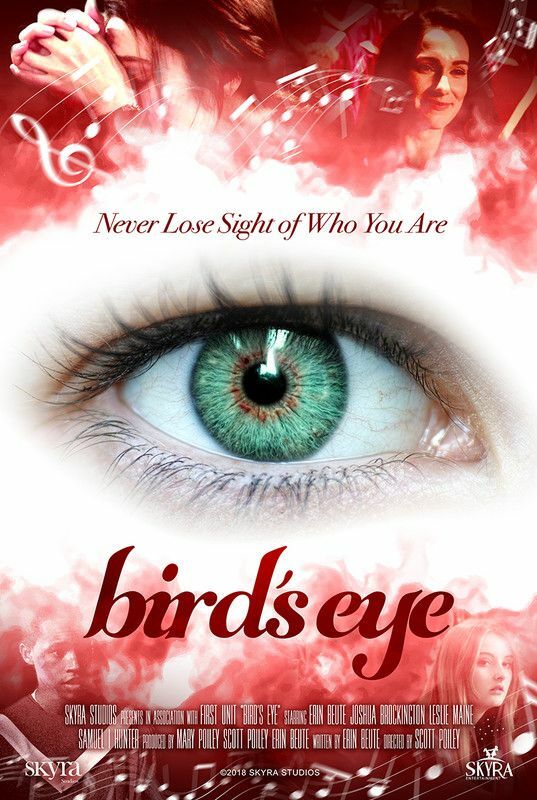 One of the short films being screened this year by the Fort Myers Beach International Film Festival is Bird’s Eye. It’s part of Short Film Package #5, beginning at 5:00 p.m. on Sunday, April 28. The 13-minute drama titled Bird’s Eye is directed by Scott Poiley. Once again, fate intervened. Just as his film career was begin to untrack, he learned that his heart was working at just 1% and he needed a heart transplant in order to save his life. In the summer of 2014, he was blessed with a new heart after just 20 days on the transplant list. Poiley has made the most of his second chance at life. 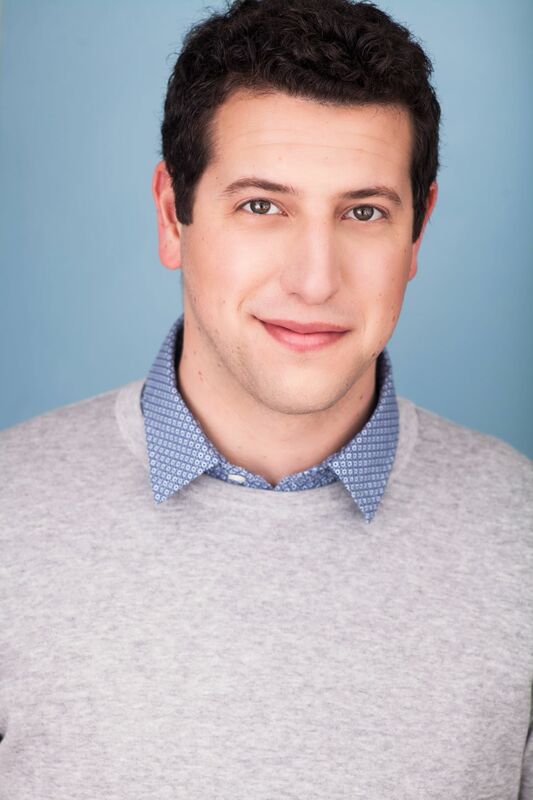 Today, he is an award-winning writer, producer, and director. 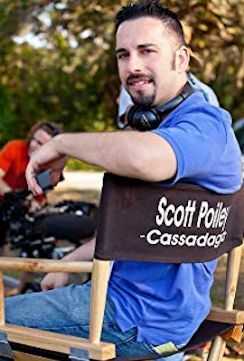 Scott began developing original feature-length content in 2013, and since then he has written and produced Cassadaga (2013), Missionary (2014), Last Shift (2015) and Her Last Will (2016). Scott wrote and directed Exhume (2016), Misfits (2017), Goose (2017), The Secret Book (2017), and The Nutcracker (2017). He has won several awards including the iHORROR AWARD for Best Direct Release Horror Film and the GOLDEN SKULL award for Best Supernatural Film for Last Shift. 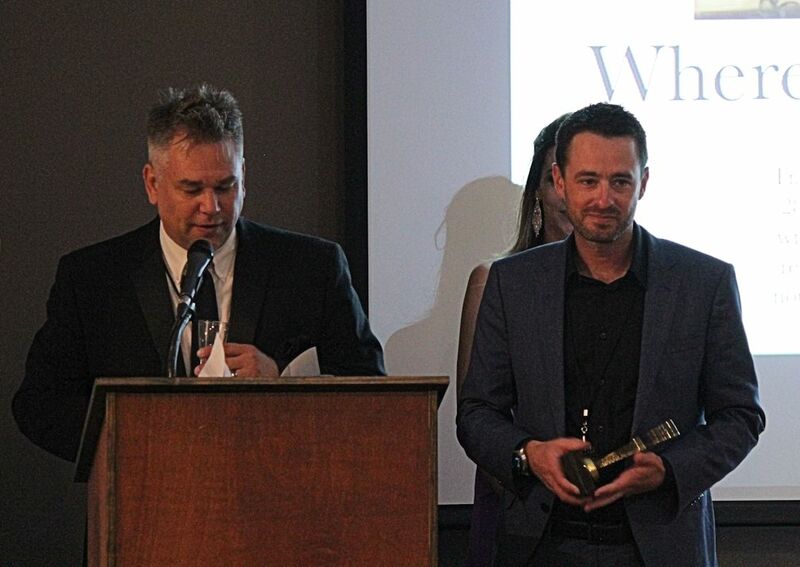 He recently won THE CREATIVE AWARDS GRAND JURY PRIZE for his Sci-fi script Vitruvian. “I am often attracted to projects with strong female leads, and this was definitely the case for Bird’s Eye,” says Poiley. “Dr. McAllister pulled at my heartstrings from page one. The script opens with our female protagonist suffering over her inability to hit the mark of her own expectation of perfection. McAllister’s emotional moment is suddenly interrupted by a female student, determined to fight her inadequate grade. The moment that follows reminds me a lot of Mozart in Amadeus. Much like Mozart, McAllister’s body fails her under the insurmountable demands she places on her music. She suffers a horrible diabetic hemorrhage culminating in the loss of her sight. “Her emotional fortitude is beautifully complicated. Strength is not measured by a simple calculation; it is the culmination of defeating our own worst fears,” Poiley concludes. Poiley loved every minute of McAllister’s journey. Audiences will love every minute watching her and the rest of the talented cast in the enigmatically titled Bird’s Eye, a riveting 13-minute dramatic short. 50 Words will be screened during Local Film Package #1 on Wednesday, April 24 by the Fort Myers Beach International Film Festival. The 28-minute short film has a clever premise. 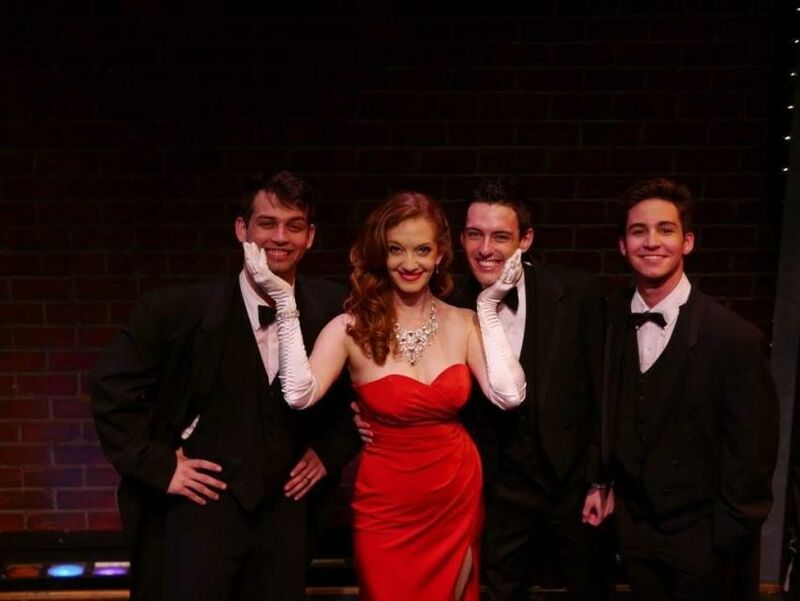 The storyline revolves around a stage actor by the name Lilly Green, who’s starring in a musical titled “Words Won’t Do.” Her boyfriend is the male lead, but sometime during the rehearsal process, Lilly catches him cheating on her with another actress in the cast. When the director reminds each actor that she needs their 50-word bio for the show bill, Lilly writes hers as a personal ad, seeking her perfect match from the audience each night following the performance. Kathryn Parks wrote, co-produced and stars in the film, which marks her transition from the stage to the realm of film and filmmaking. Parks’ inspiration for the film came when she was asked to tell the love story of two dear friends at their marriage. Transforming the concept into an actual script didn’t happen overnight however. The final product contains snarky lines, hysterical sight gags and some really good situational comedy. But the strength of the script inheres in the character arc that Lilly Green traverses over the course of the film. While the audience initially feels sorry for the jilted leading lady and roots for her to find true love, it eventually becomes apparent that she’s self-centered and self-aggrandizing. It would be easy to dismiss their discontent as petty jealousy, but then we watch Lilly as she fails to recognize a fellow actor who has three on-stage scenes with her in the show. It’s not a mere matter of failing to remember his name. (It’s Dillon.) She doesn’t recognize him at all! And then it comes. “Have you ever read anyone else’s bio?” he asks. She hasn’t, of course. She doesn’t read anything that’s not about her. After all, she’s the center of the universe. No one else matters. Our leading lady is many things, but stubborn is not one of them. 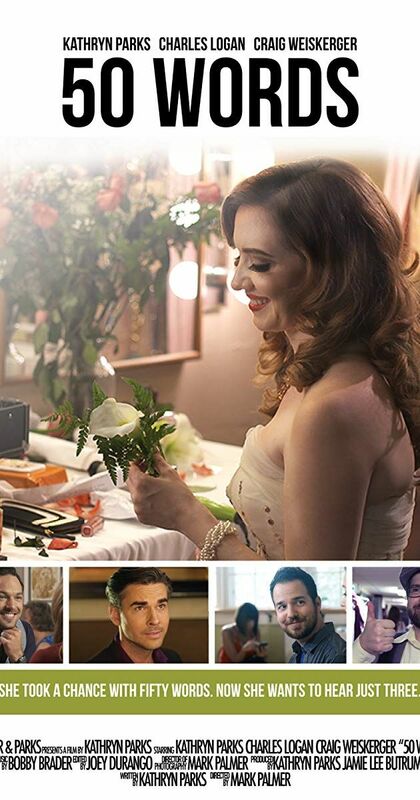 She takes Dillon’s advice and reads the bios of her cast mates and the director. Her perfect match has been staring her in the face all along. Which just goes to show – when you look beyond yourself, anything is possible, including true love and pineapple pizza. 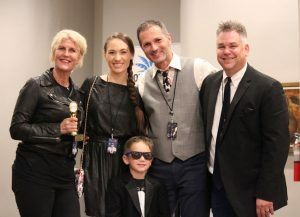 The tandem knew they’d also need another producing powerhouse whose skill set complemented theirs, so they reached out to actor/singer/theater jack-of-all-trades, Jamie Lee Butrum. Those wheels included a crowdfunding campaign, filming, editing and submission to film festivals around the country. Not only was 50 Words juried into the Fort Myers Beach International Film Festival, it was an official selection of the Sarasota Film Festival, the Bonita Springs International Film Festival and the Et Cultural Festival in St. Petersburg. 50 Words has already earned a number of accolades. 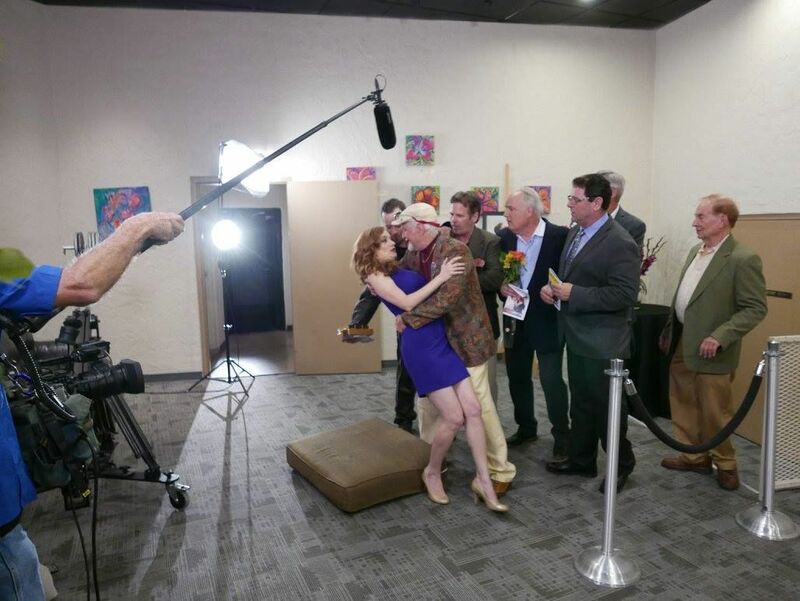 The film was the Tampa Bay Underground Film Festival’s Best Florida Short and was nominated for Best Comedy at the Rendezvous Film Festival and for Best Comedy or Musical by the Prince of Prestige Academy Award. 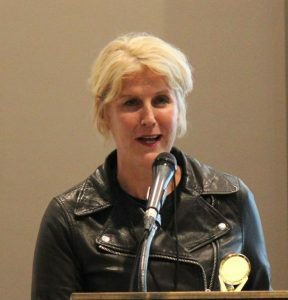 For her part, Kathryn Parks received a Ladies in Film and Entertainment Award for her role in the film. Local Film Package #1 begins at 5:30 p.m. on Wednesday, April 24. 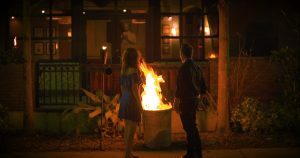 50 Words will be screened during Local Film Package #1 on Wednesday, April 24 by the Fort Myers Beach International Film Festival. The 28-minute romantic comedy stars and was written and co-produced by Kathyrn Parks. 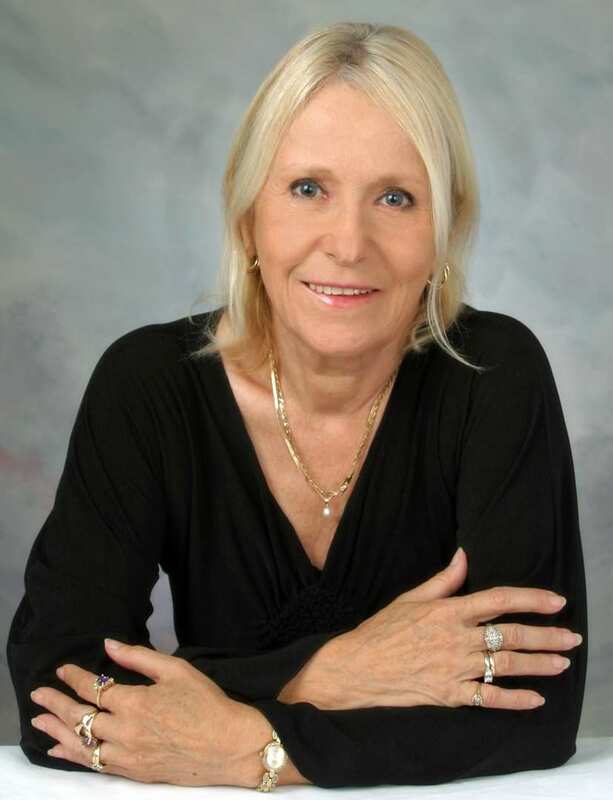 Kathryn Parks has established herself as one of Sarasota’s most recognizable leading ladies. 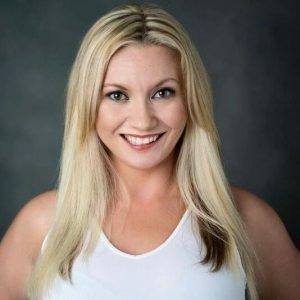 A singer, actor and dancer, she is a regular in the region’s musical theater scene. She has starred in productions of My Fair Lady, Carousel and The King and I, receiving acclaim for her portrayal of Eliza Doolittle, Julie Jordan, and Anna Leonowens respectively. 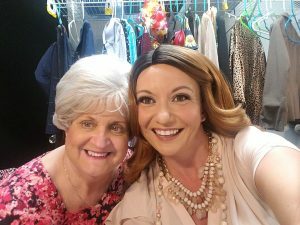 She has appeared on numerous stages including the Florida Studio Theatre, American Stage, the Players Theatre, Venice Theatre, and with the St. Petersburg Opera Company. Her stage credits also include Maggie in Cat on a Hot Tin Roof, Edythe Herbert in My One and Only, Violet in Violet, Melody in Bad Jews, Polly in Crazy for You, Maria in Sound of Music, Isabelle in Pirates of Penzance and Anne in La Cage aux Folles. 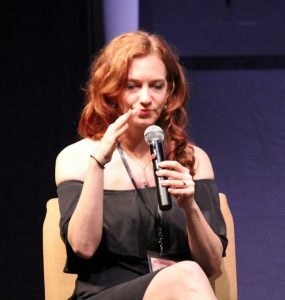 In addition to 50 Words (which earned Parks a Ladies in Film and Entertainment award on January 15, 2019 from the Sunshine City Film Festival at St. Petersburg’s Palladium Theatre), Parks’ film and television credits include Killroy Was Here (a new short by Kevin Smith), The Glades Perfect Storm, Listening, Rocky Mountain Fast Guy, Carol’s Daughter, Beneva’s Christmas Special and Mr. Engagement. Also known to the concert and cabaret scene, Kathryn performs with the trio Vocal Vixens. Her voice has been called “sparkling” by Scene Magazine while the Bradenton Herald has described her as “portraying genuine star power.” Kathryn also holds the distinction of having tossed a football with Dan Marino (in a Pappa John’s commercial), hiked across the country of Israel, danced in a McLaren convertible across Sarasota’s Ringling Bridge at sunset (see her “Get Happy” video) and graduated 6th in her high school class (while not a nerd, she’s nevertheless exceptionally smart). Kathryn has a B.A. 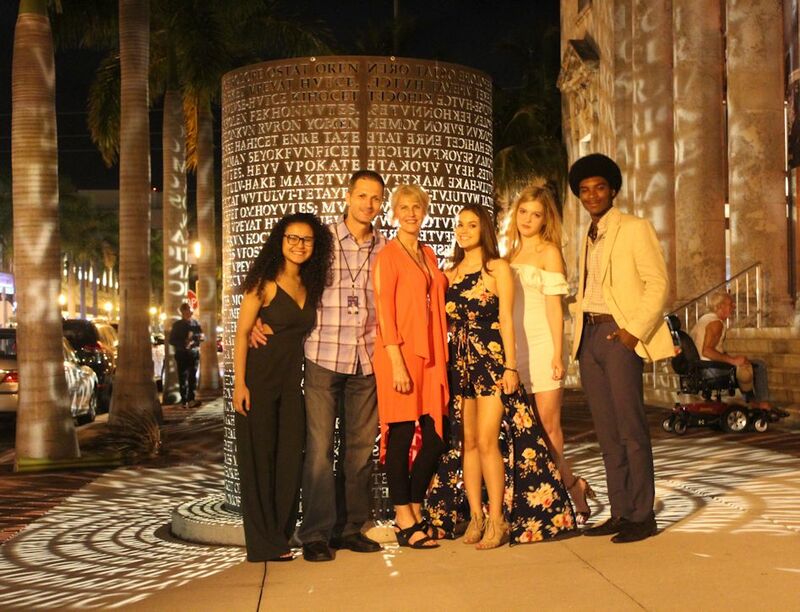 in Theare Arts from the University of Miami and now studies with Carlo Thomas and Sharon Lesley. 50 Words will be screened during Local Film Package #1 on Wednesday, April 24 by the Fort Myers Beach International Film Festival. The 28-minute romantic comedy stars and was written and co-produced by Kathyrn Parks. Mark Palmer directs. 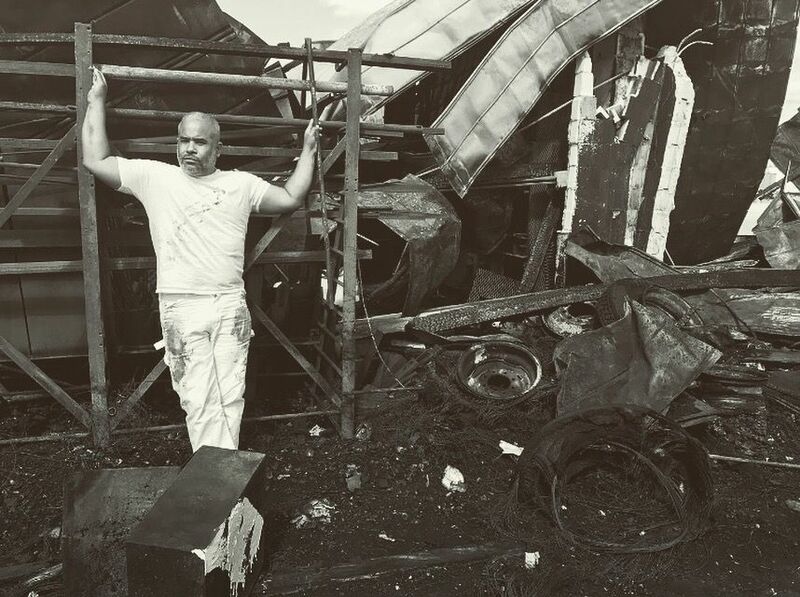 Palmer is an award-winning photographer, cinematographer, director and producer who has been working behind the camera for more than 14 years. He is the founder and president of Sarasota-based Mars Vision Production. Palmer’s credits include various regional corporate projects. He was also the grand prize winner in the Viral Film Project and won Best Story awards for Devotion in the 48-Hour Guerrilla Film Challenge and the PBS documentary series, Diamonds Along the Highway. For more, please visit http://www.marsvisionproductions.com. The 9th Annual Fort Myers Film Festival wrapped up last night with a dessert and champagne awards ceremony at the Broadway Palm Dinner Theatre. Each of the 89 films juried into this year’s festival were exceptional this year and deserving of accolades in many respects. 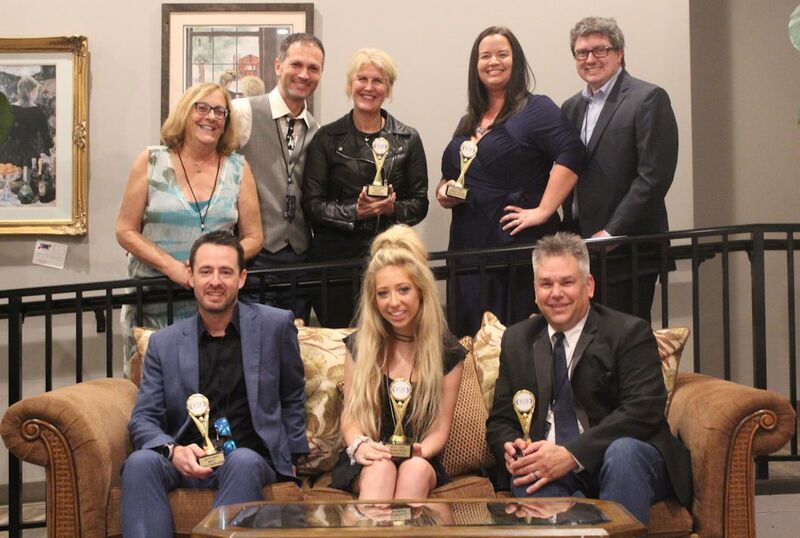 But that didn’t deter Director Eric Raddatz and his team from the challenging task of choosing winners in seven categories … And the winners are …. Where There is Darkness was named by the Fort Myers Film Festival as Best Documentary. 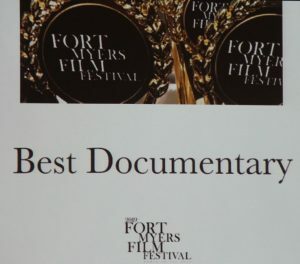 The feature-length documentary has been accepted into more than 40 film festivals since being completed last year and has won more than 30 awards. 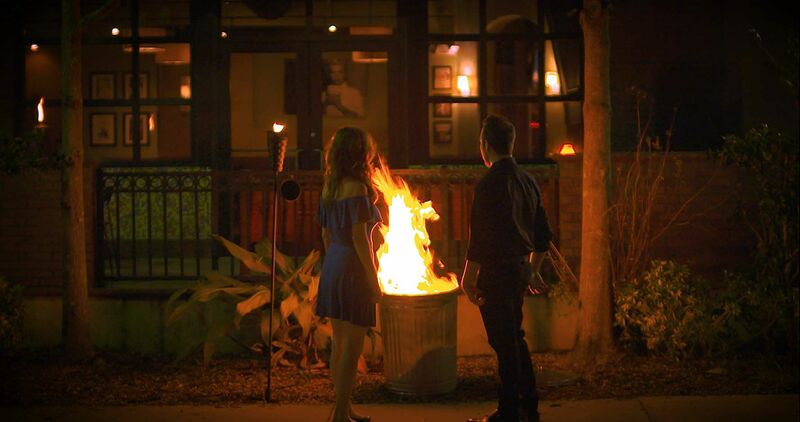 The film was made by Orlando-based production company Stella Mar Films. 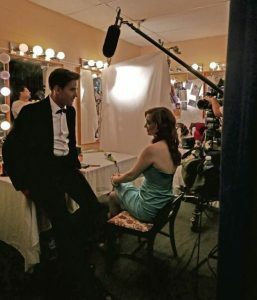 Filmmaker Sean Bloomfield used an imaginative mix of actual footage, eyewitness interviews and staged re-enactments to tell the story of the nationwide search for Fr. Rene Robert, a beloved priest who went missing from St. Augustine, Florida in 2016, detail the apprehension, incarceration and sentencing of the 28-year-old man who abducted and killed the priest, and draw attention to the complex psychological factors that led him to murder the very man who had so assiduously tried to help him. You will find the remainder of this review here. 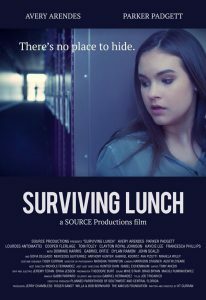 On Saturday, April 13, the 9th Annual Fort Myers Film Festival will screen the feature film Surviving Lunch produced by Source Productions. Based on true stories about real American teenagers ripped from today’s harrowing headlines, this timely and important film shines a light on bullying and school violence. The film revolves around a Latina girl from New York who moves to Florida with her mother after her father is killed before her eyes in a school shooting. Trying to keep to herself and recover from her grief, Gabriella notices a boy being relentlessly bullied in the lunchroom. With the memory of her father fresh in her heart, Gabriella is determined to find a way to stop the bullies – even if it means standing up to the meanest kid in the school. Read here for the rest of this article. 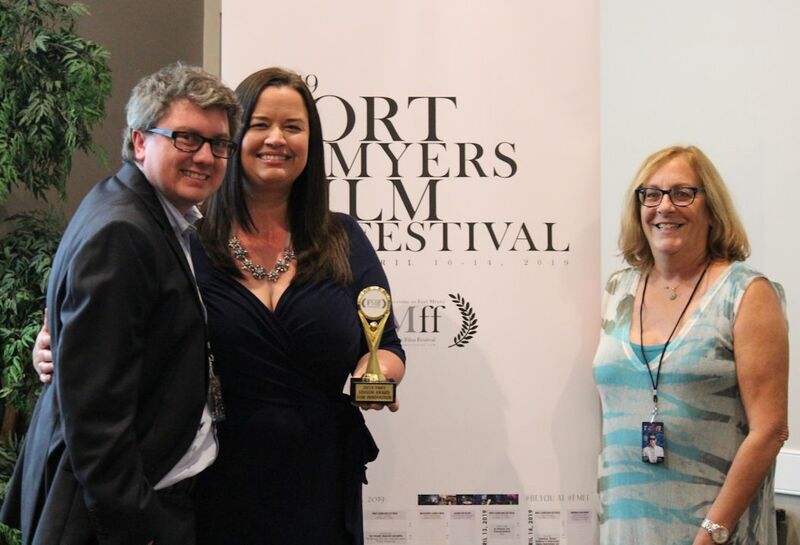 On Saturday, April 13, the 9th Annual Fort Myers Film Festival screened the feature film Surviving Lunch. 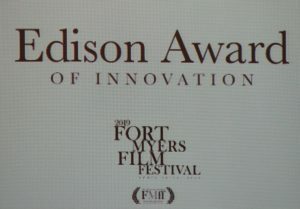 The next day, the Fort Myers Film Festival chose it as Best Feature … just one day after it received the Audience Award for Best Narrative Feature. 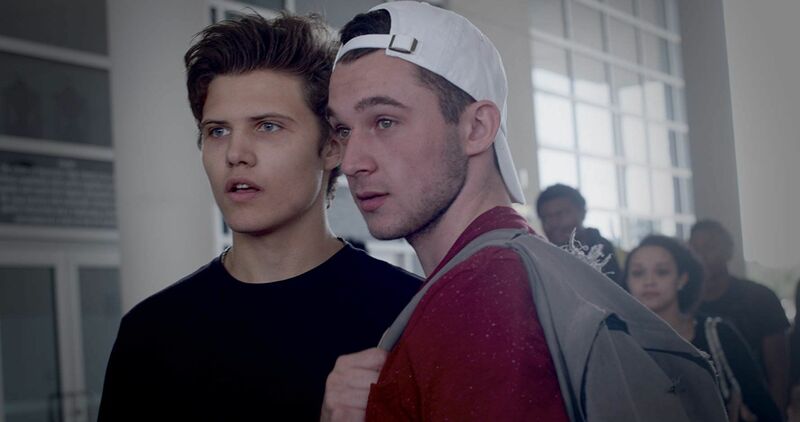 Based on true stories about real American teenagers ripped from today’s harrowing headlines, this timely and important film shines a light on bullying and school violence. 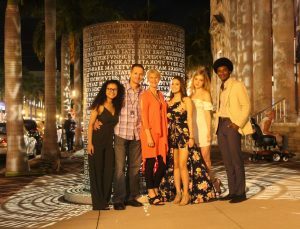 The film was produced by Sarasota-based SOURCE PRODUCTIONS for Planned Parenthood of Southwest and Central Florida, an educational touring theatre and video production company for young adults (ages 14-30). 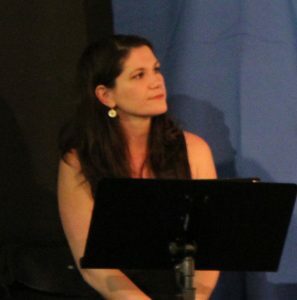 SOURCE’s Artistic Director KT Curran wrote and directed the film. 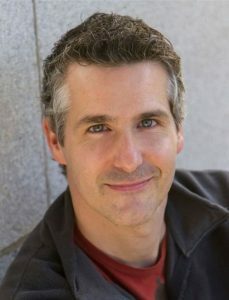 Curran is a nationally-published playwright, screenwriter, editor, director and Equity actor. 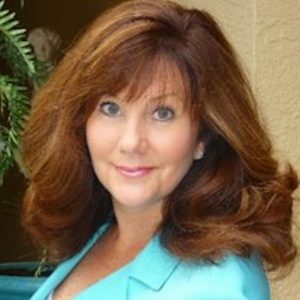 She has worked extensively in theater and film for more than twenty-five years, performing and directing both nationally and internationally. KT has written twenty-five plays, five films, a web series, commercials and several documentaries for young adults. 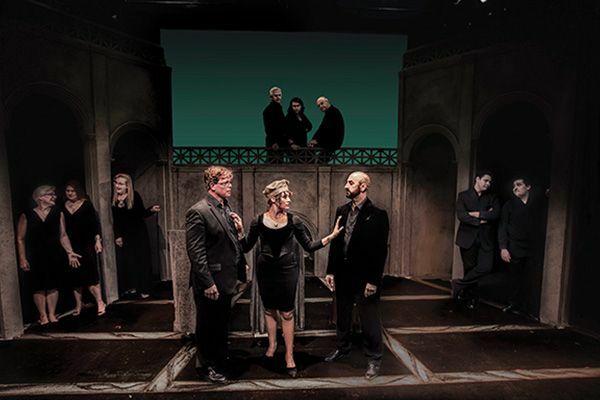 Eleven of KT’s plays are nationally published and performed by groups across the United States. 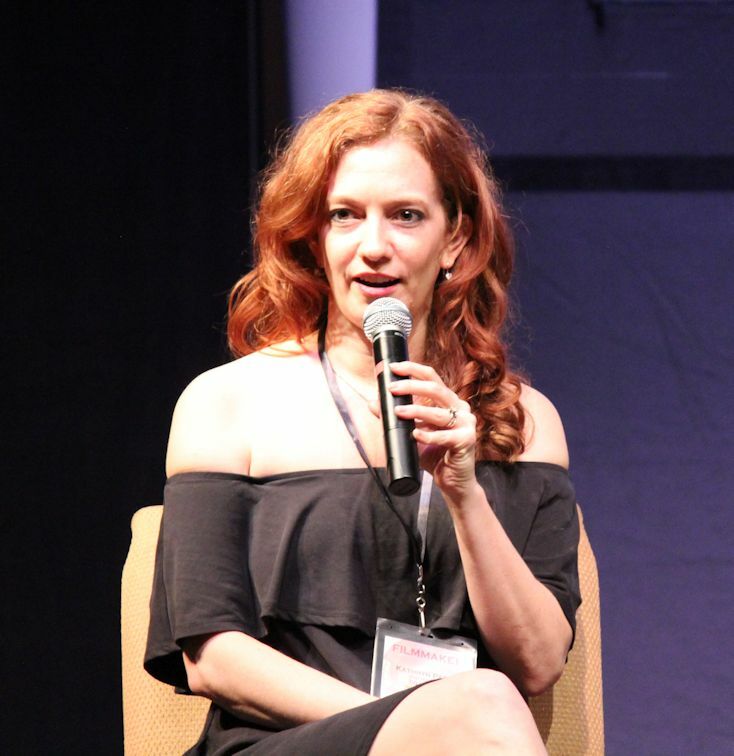 Her film directing and screenwriting credits include two features, Surviving Lunch and The First Time Club, and three short films, The Holding Cell, When the Party Ends and Boost. The rest of KT’s profile is here. 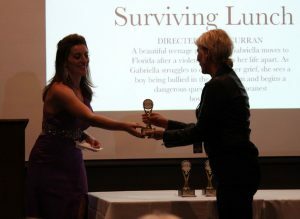 The SOURCE PRODUCTIONS indie feature Surviving Lunch took Best Feature Film honors at this year’s Fort Myers Film Festival. The film revolves around a Latina girl from New York who moves to Florida with her mother after her father is killed before her eyes in a school shooting. Trying to keep to herself and recover from her grief, Gabriella notices a boy being relentlessly bullied in the lunchroom. 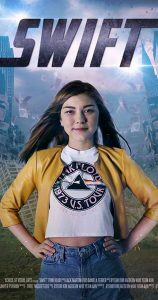 With the memory of her father fresh in her heart, Gabriella is determined to find a way to stop the bullies – even if it means standing up to the meanest kid in the school. Avery Arendes stars as Gabriella. Go here for the rest of Avery’s profile. 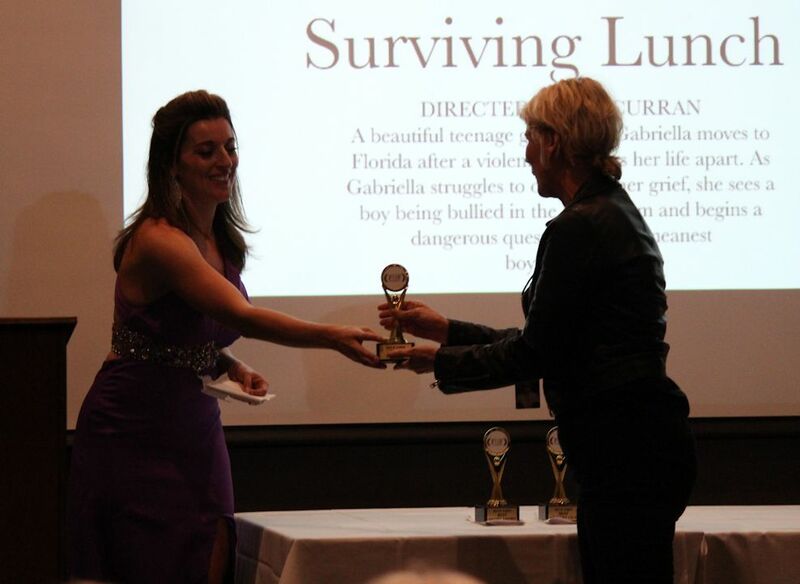 The SOURCE PRODUCTIONS indie feature Surviving Lunch took Best Narrative Film honors at this year’s Fort Myers Film Festival. 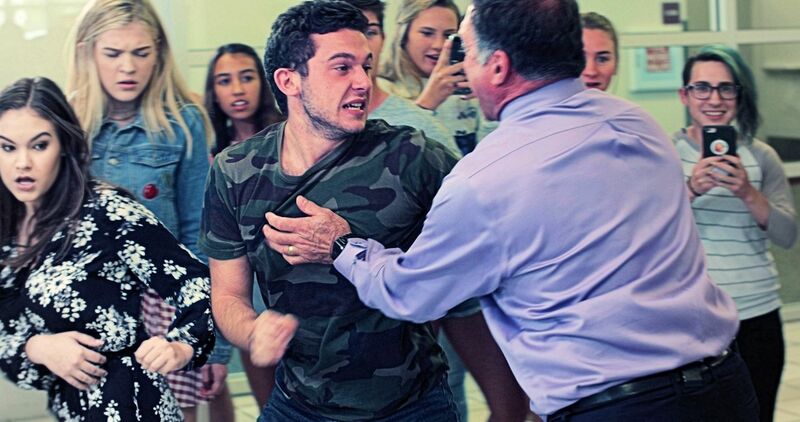 The film shines a light on lunchroom bullying and schoolhouse violence, and playing the bully is Sarasota native Parker Padgett. For more on Parker Padgett, go here. 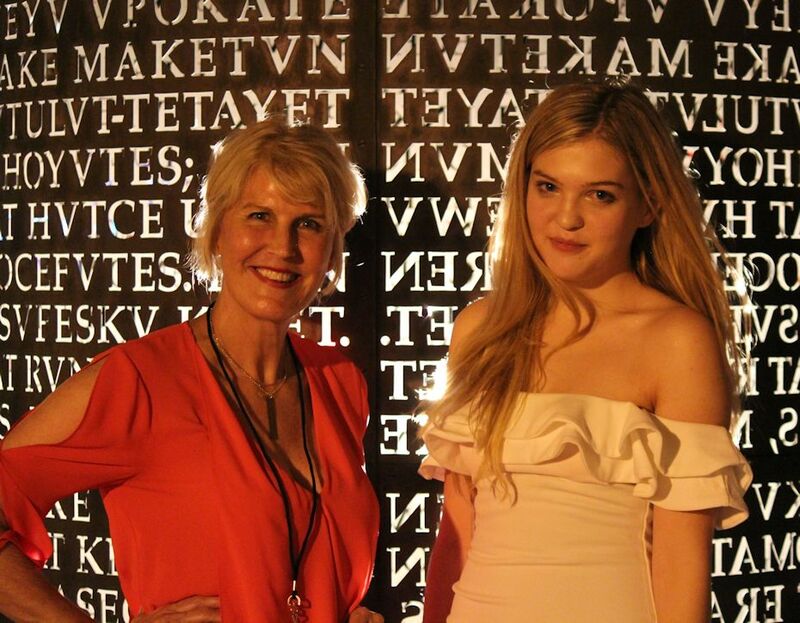 Kaycie Lee is a SAG-eligible film actress who lives and goes to school in Sarasota. 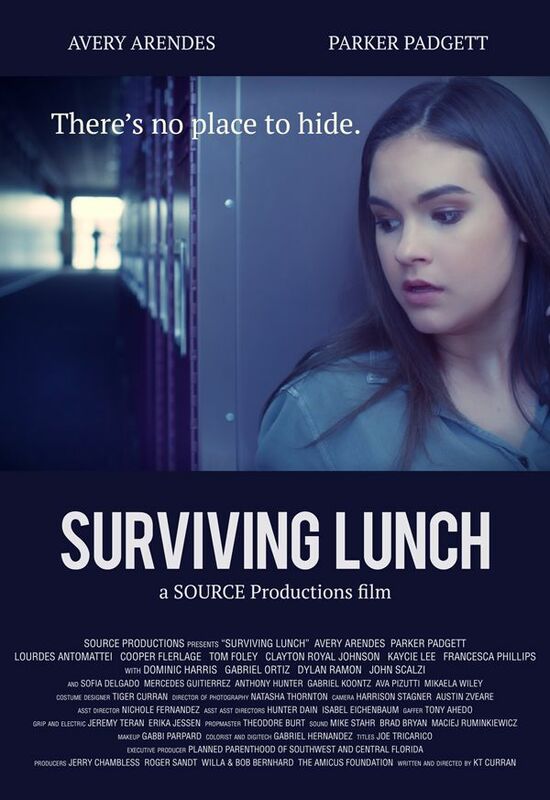 Her latest project is a strong supporting role in the SOURCE PRODUCTIONS indie feature film Surviving Lunch, in which she portrays a high school girl named Lacey who is willing to sacrifice her own identity just in order to fit in. You can access Kaycie’s full profile here. 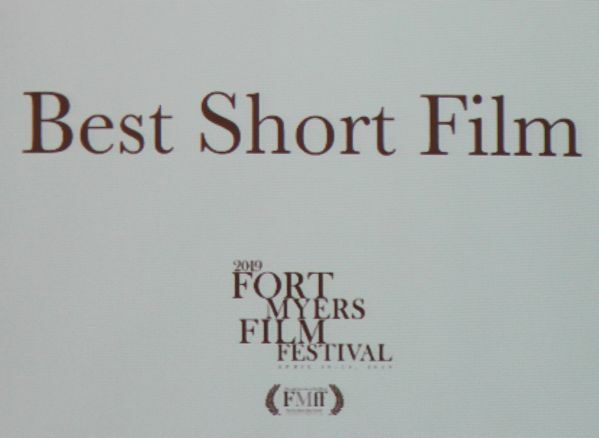 The SOURCE PRODUCTIONS indie feature Surviving Lunch was screened at this year’s Fort Myers Film Festival in the Sidney & Berne Davis Art Center on Saturday, April 13. Mercedes Nicole Gutierrez plays Maria. Go here for the rest of Mercedes’ profile. 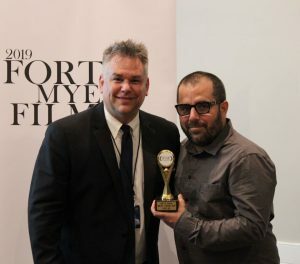 Peggy won Best Short Film honors at this year’s Fort Myers Film Festival, which featured a particularly strong field of short films and filmmakers. Peggy is hosting a birthday party for her little boy. But we don’t meet Peggy initially. Instead, we meet two guests as they are dressing for the party and wrapping a present for the birthday boy. 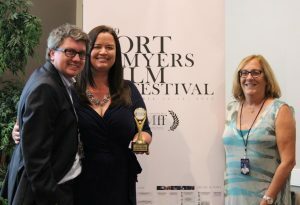 Peggy won Best Short Film honors at this year’s Fort Myers Film Festival, which featured a particularly strong field of short films and filmmakers. 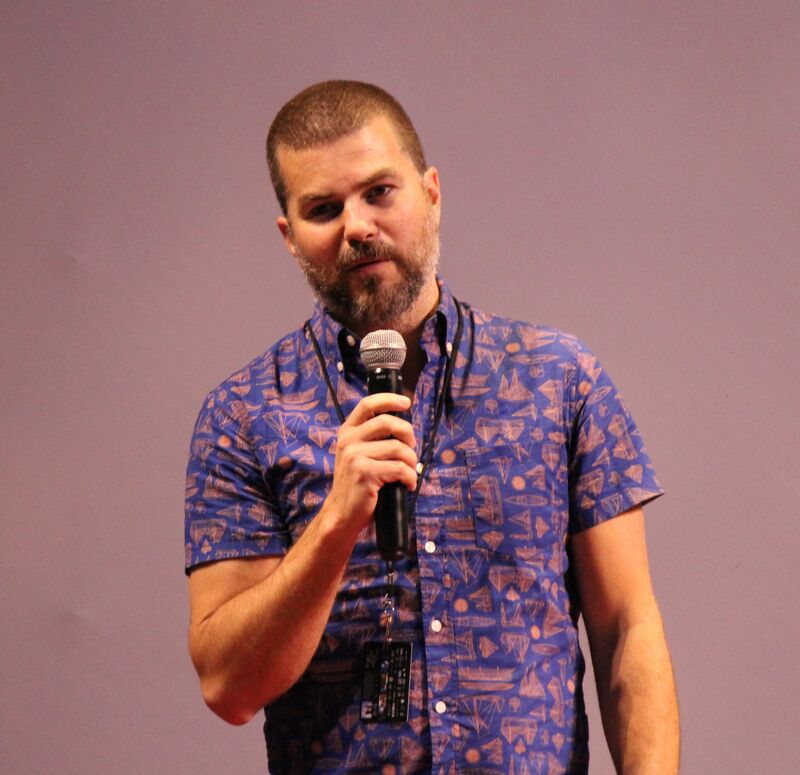 It was written and directed by Justin O’Neal Miller, whose other production credits include Pisser (short 2017), The Roach (short 2017/writer), If We Are Apart (short 2016), Restitution (short 2013/writer) and A Lady Can Live Through Anything (short 2010/writer). 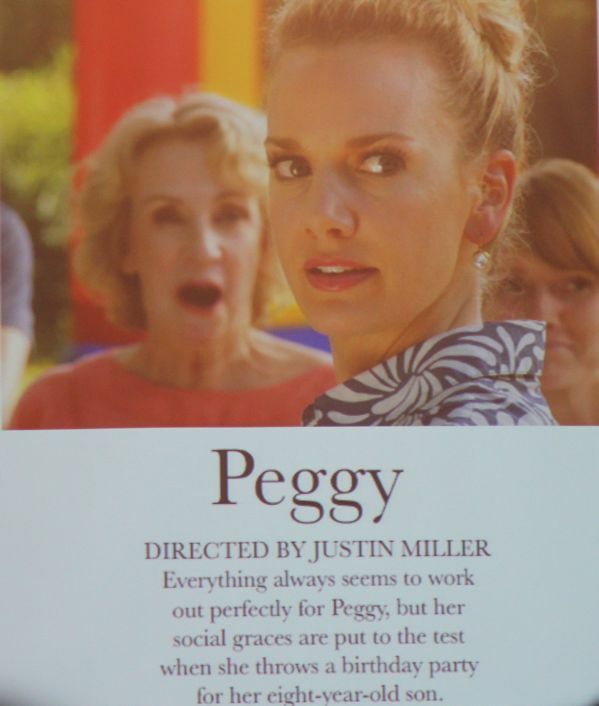 Peggy has enjoyed considerable film festival success since its premiere in October of 2018. Because viewers kept repeating “we want to see more of that,” he’s been transforming the short into a half-hour comedy series with the same cast. “I’m also in late development on an adventure-comedy feature called The Last Blockbuster, with intention to take it into production later this year,” Miller shares. For more on Justin, read here. 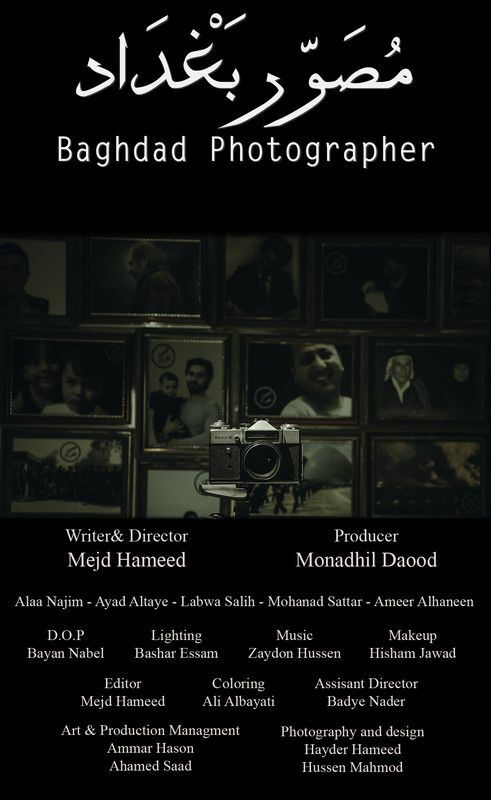 Baghdad Photographer took Best Short Short Film honors at this year’s Fort Myers Film Festival. 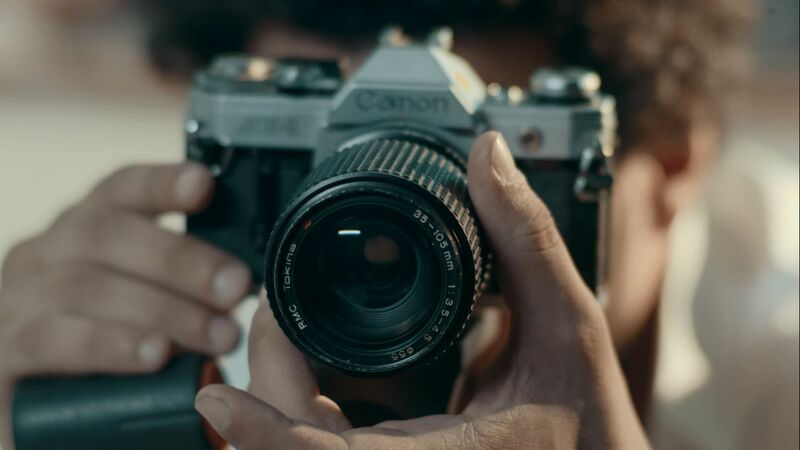 In this brief film, Hameed tells the story of the hardships suffered by an Iraqi family as a result of the wars and violence that have ravaged the country for decades. He does this through a series of photographs taken by the family matriarch over the course of two generations, beginning with a portrait of a pregnant young mother and her husband attired in regular clothing. The next photograph shows the same woman, her husband and the little boy they had, but this time the husband is dressed in a military uniform. The ensuing portrait depicts the woman dressed in black to mourn her deceased husband. In this shot, she poses with her grown son and his pregnant wife. Now a man, the boy is attired like his father before him in military garb. In the final poignant picture, we see the mother and daughter-in-law both dressed in black because both the husband and son have been killed fighting in the Iraqi army. Read here for more on this film. 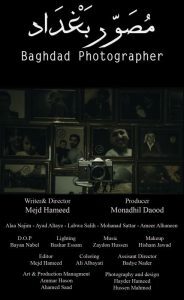 Mejd Hameed’s tightly-packed evocative film Baghdad Photographer received Best Short Short honors at this year’s Fort Myers Film Festival. Mejd Hameed is an Iraqi filmmaker, screenwriter and actor. 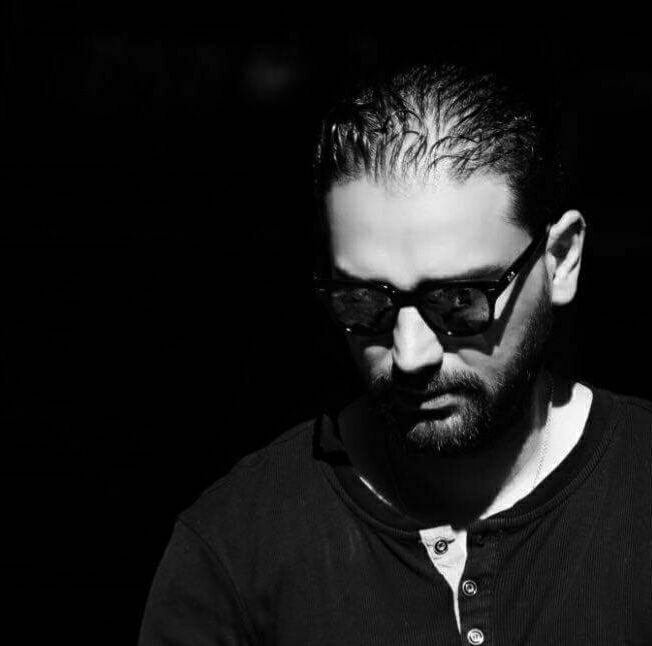 He is a member of the Iraqi Artists Syndicate, Union of Iraqi Dramas and the National Band of Representation. His filmmaking credits include Baghdad Photographer (writer and director), Ahrar (writer and director), and Zero Hour (writer). His acting credits include Date (2017), Smile Again, Goodbye Nineveh, Zero Hour and Mesopotamia. 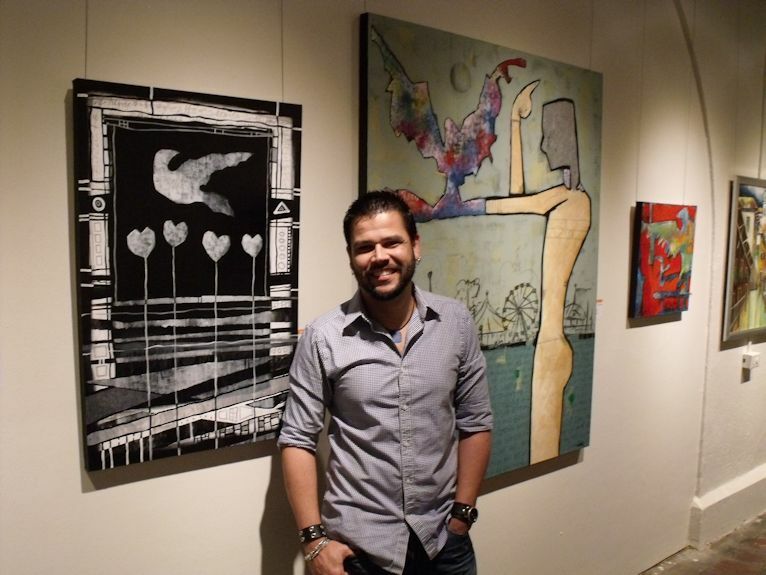 Born in 1981, he has a Bachelor of Fine Arts from the University of Baghdad. 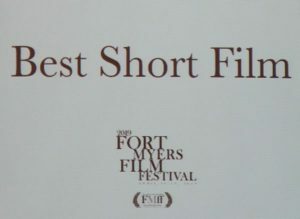 Swift received Best Student Film honors at this year’s Fort Myers Film Festival. 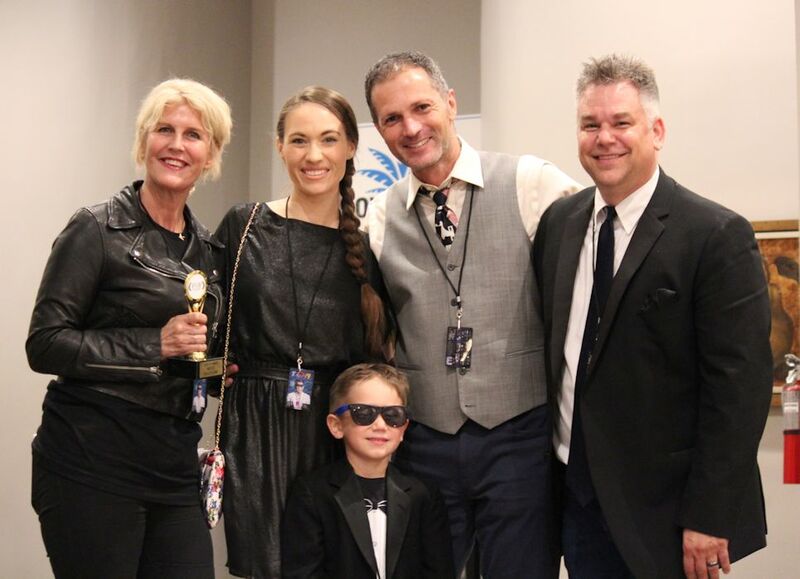 It was also selected by Festival Director Eric Raddatz for a second screening during the champagne and dessert awards ceremony at the Broadway Palm Dinner Theatre last Sunday night (April 14). Produced as a thesis for the School of Visual Arts in New York City, the film sees a young girl gain superpowers simply by waking up late for school. When she accidentally knocks a coffee cup off the kitchen table, she discovers that she has the power to slow time to nearly a standstill – permitting her to catch the cup before it crashes to the floor. To test her newfound superpower, she tosses a banana across the table, then slowly walks to the other side of the table to catch the banana in one hand. Positivation Films’ documentary film Eliades Ochoa From Cuba To The World has been chosen by the Fort Myers Film Festival as its Best Local Film 2019. The film lovingly narrates the story of Eliades Ochoa, one of the founding members of the Buena Vista Social Club, whose music left an indelible imprint on the international community’s perception of Cuba. Ochoa grew up immersed in Son Cubano, a genre of music originating in east Cuba in the late 1800s that blends the clave rhythms of the Bantu region with Hispanic vocal styles. Both of Ochoa’s parents played Son Cubano, as did his brothers, with his sister providing vocal support, so Ochoa taught himself to play Son on the guitar. 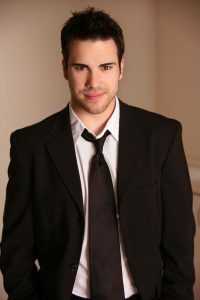 Soon, he was playing locally, collaborating with well-known Cuban musicians and touring with a group around the island. 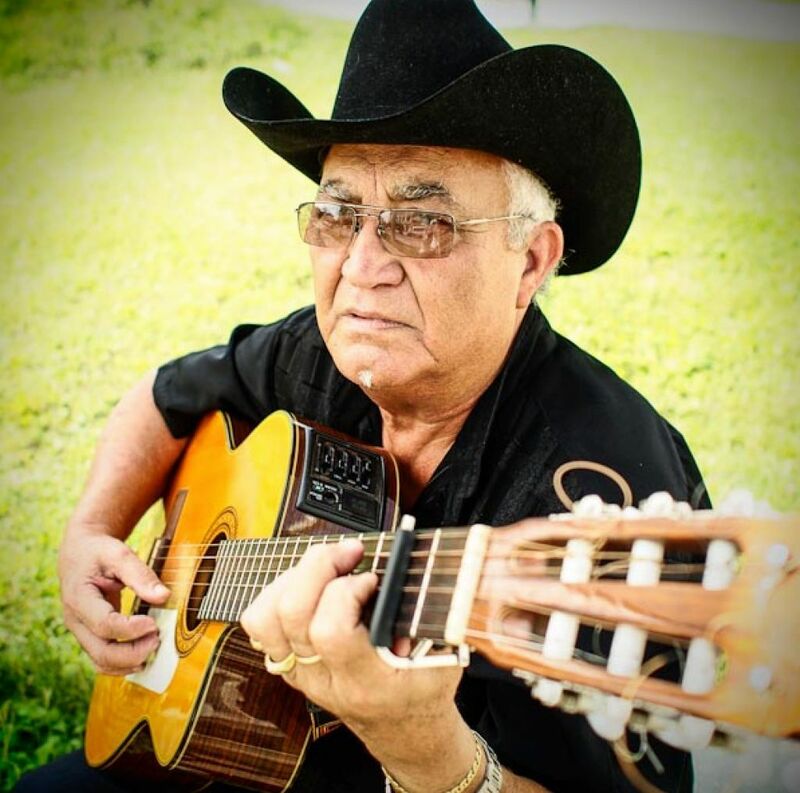 Happenstance led to his inclusion a number of years later in the original line up of the Buena Vista Social Club, which also included Ibrahim Ferrer, Compay Segundo, Ruben Gonzales, Pío Leyva, Omara Portuondo, Joachim Coorder, Orlando “Cachaito” Lopez and Barbarito Torres. In six days, they busked out a record comprised mainly of Son songs that came out in pre-revolutionary Cuba in the ’20s, ’30s and ’40s. 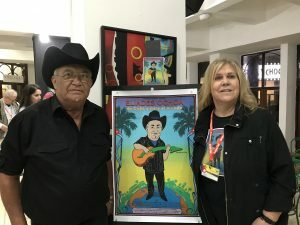 The album became an emblem of Cuba, popularizing Cuban music in the West and drawing scores of tourists to the island in spite of the 1958 U.S. trade embargo. 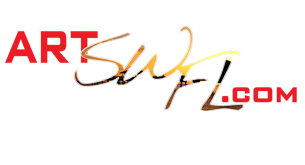 It won several awards, including a Grammy in 1998 for the Best Tropical Latin Album. Wim Wenders’ documentary a year later about the making of the record, Beuna Vista Social Club, was nominated for Oscars, BAFTAS, and a slew of other awards at film festivals all over the world. 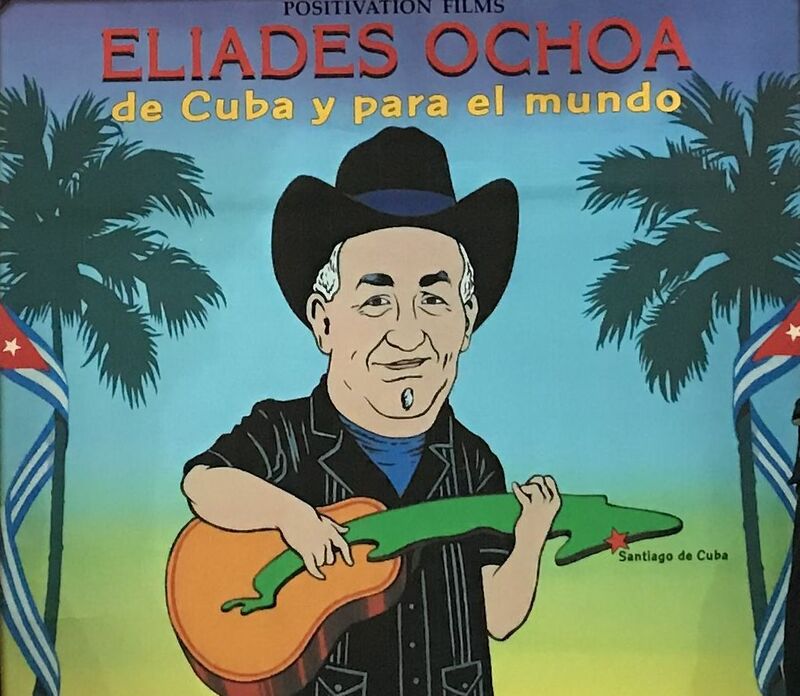 Positivation Films will be screening the documentary film Eliades Ochoa From Cuba To The World at The Ft. Myers Film Festival. The film tenderly narrates the story of Eliades Ochoa, one of the founding members of the Buena Vista Social Club, whose music left an indelible imprint on the international community’s perception of Cuba. The documentary was produced and directed by Positivation Films founder Cynthia Biestek. 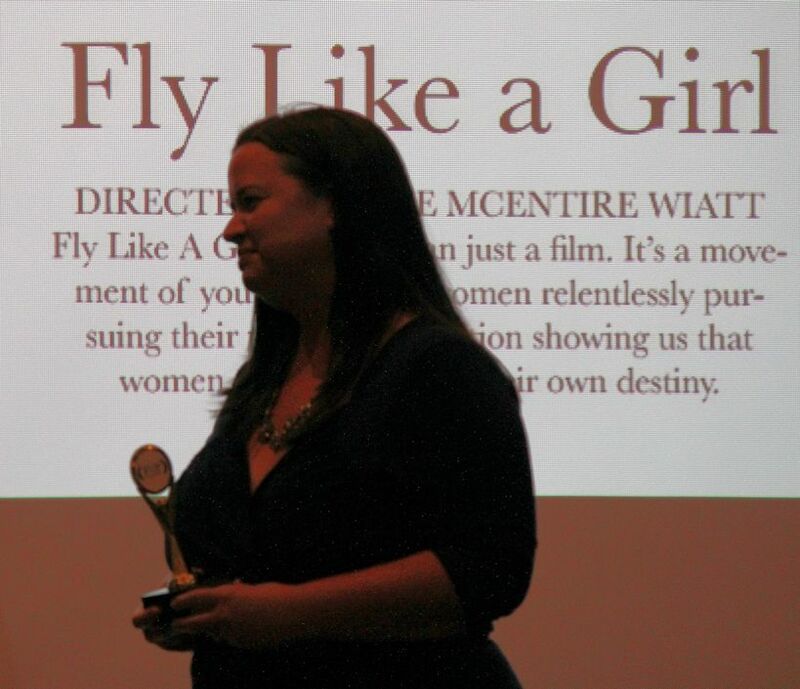 The Fort Myers Film Festival conferred its inaugural Edison Award of Innovation on Katie McEntire Wiatt’s documentary Fly Like a Girl. 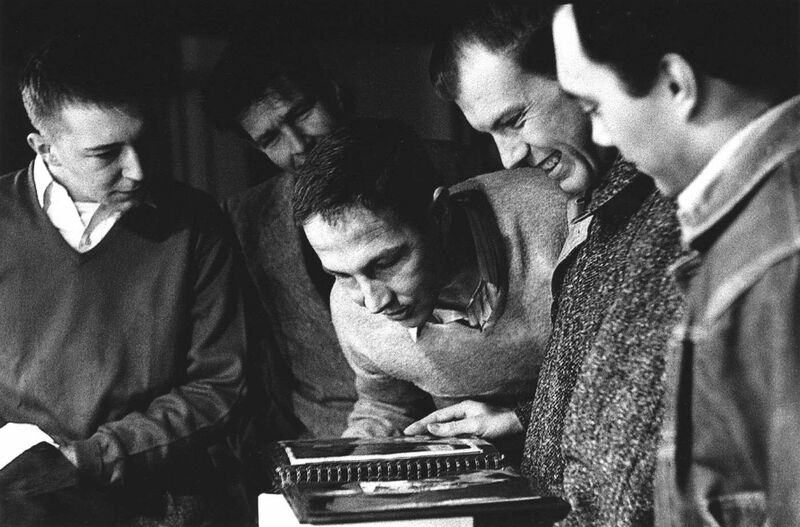 The award recognizes distinct innovation and invention in film. 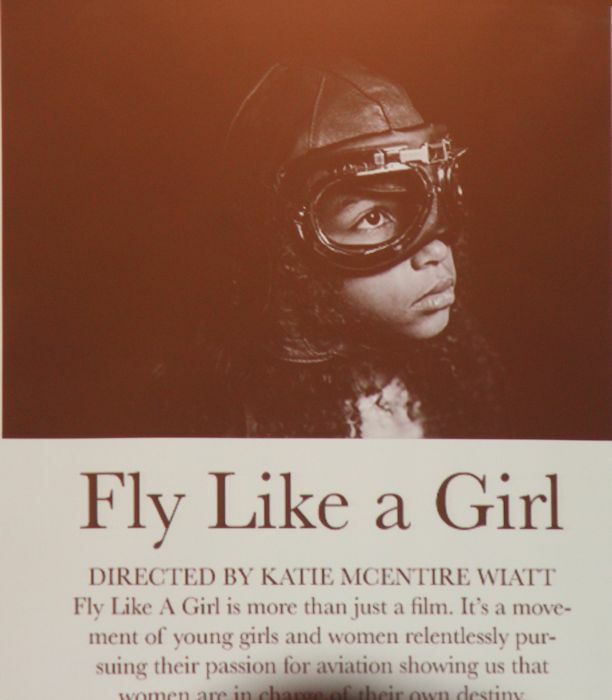 Fly Like A Girl is more than just a film. It’s a movement of young girls and women relentlessly pursuing their passion for aviation – a field currently dominated by men. The film relates first-hand stories from girls and women who dared to aim higher. From a lego-loving young girl who includes female pilots in her toy airplanes to a courageous woman who helped lead shuttle missions to space, Fly Like A Girl shows us that women are in charge of their own destiny. Go here for more on this film. The documentary Fly Like a Girl screens during this year’s Fort Myers Film Festival at the IMAG History and Science Center. 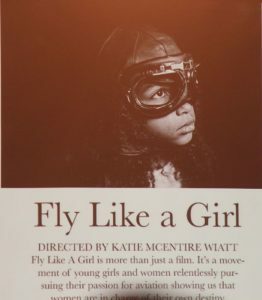 More than just a film, Fly Like a Girl is a movement of young girls and women relentlessly pursuing their passion for aviation – a field currently dominated by men. The film also represents filmmaker Katie Wiatt’s feature-length directorial debut. 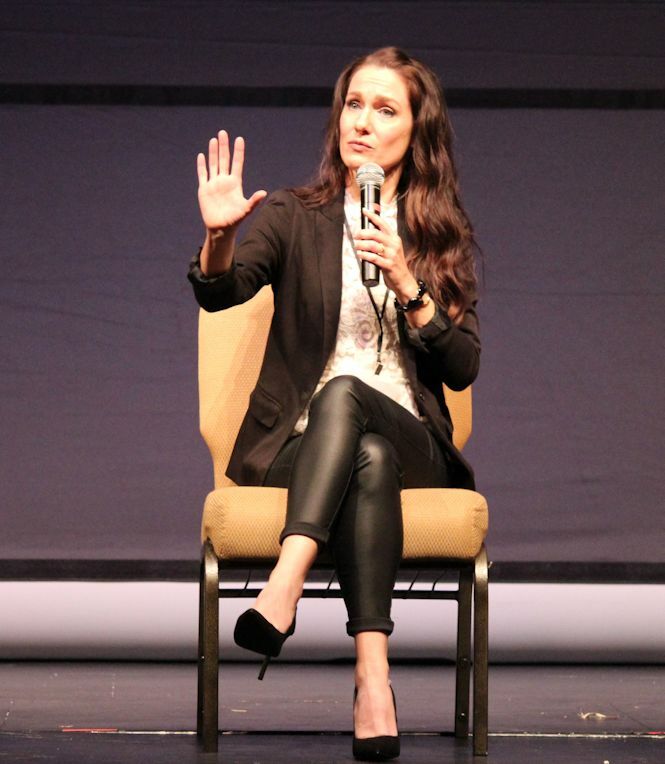 Katie first explored film production as a student at the Alexander W. Dreyfoos School of the Arts in West Palm Beach, FL. 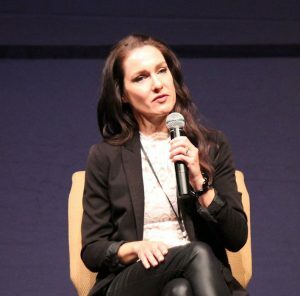 At Dreyfoos, not only did she learn to edit on one of the first non-linear editing systems, but she also learned the fundamentals of cinematic storytelling. But it was during her years as an elementary school teacher in her home state of Florida where Wiatt found her true calling as a documentary filmmaker. The rest of Katie’s profile is here. The Davis has issued a call for artists for its June juried exhibition. 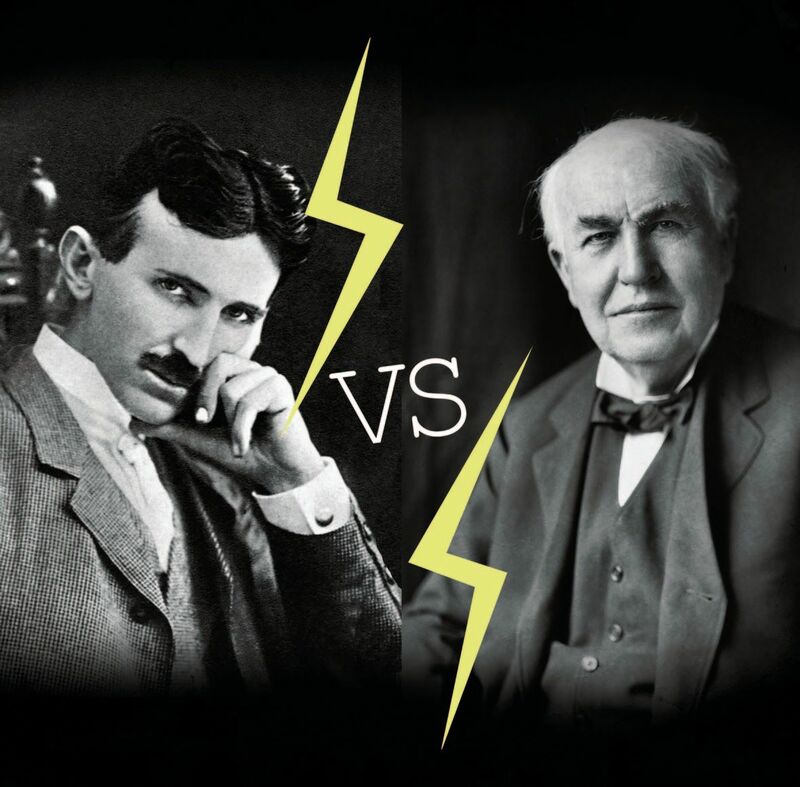 AC vs. DC: Tesla vs. Edison asks artists to use these two historic inventors to create original works of art inspired by their era, discoveries, interests, characters, legacies and, of course, their legendary rivalry. Spark an interest in the onlooker with pieces that offer a unique perspective on these powerful and innovative figures and the way their ideas and personas drastically changed the world. Recall the age of invention in the turn-of-the-century style exhibition! Merge technology and art. Submit by May 11th. The Caloosahatchee River, part of the Everglades watershed, is the largest subtropical wilderness in the United States — home to unique orchids, trees and bromeliads. 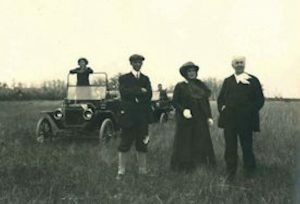 Both Thomas Edison and Henry Ford loved the rich and varied flora and fauna that grew around them here in Fort Myers. 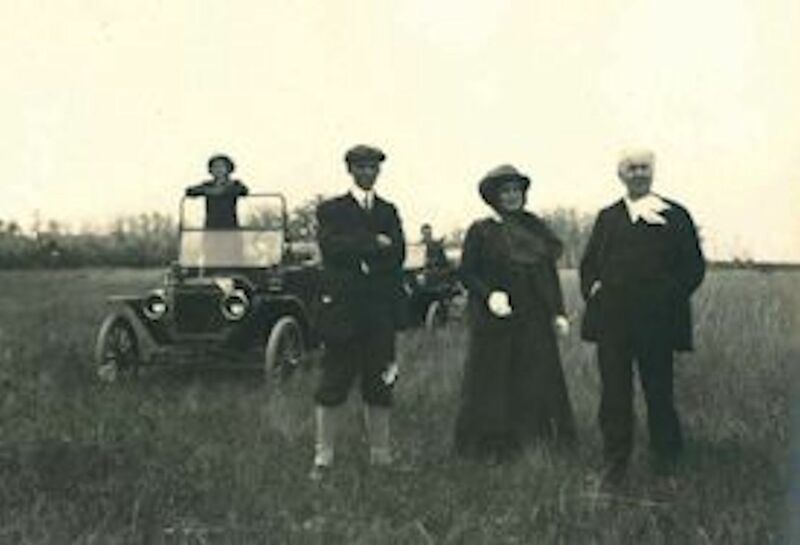 Edison called his lush estate here in Fort Myers his “jungle” because of the diversity of plant life that thrived. Ford was an avid bird watcher and enjoyed camping, boating and fishing throughout his life. 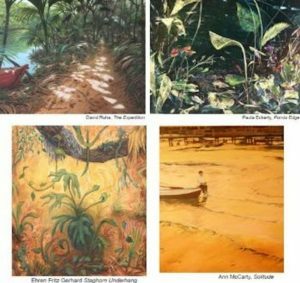 So it only made sense for the Edison & Ford Winter Estates to ask artists from across the region to interpret the Edison and Ford families’ love of Florida’s natural environment. 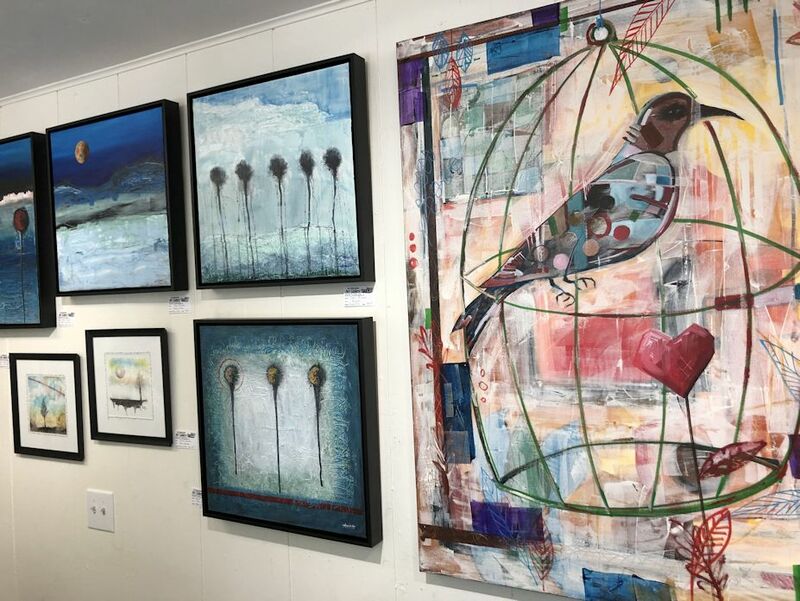 The result is an exhibit that features work in a variety of mediums (including oil, watercolor photography and sculpture) by 30 award-winning artists from across the Southeastern United States. It’s on display now through May 19 in the Caretaker’s Cottage. 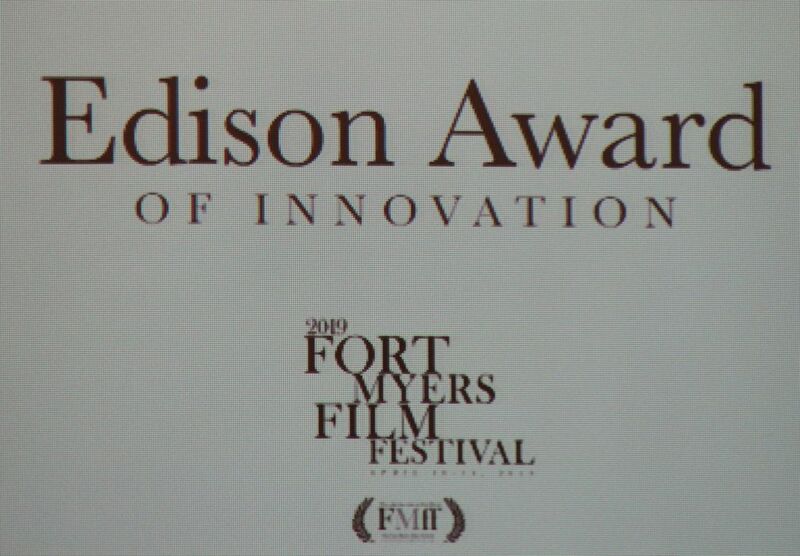 Access to the show is included with admission to the Edison & Ford Winter Estates. 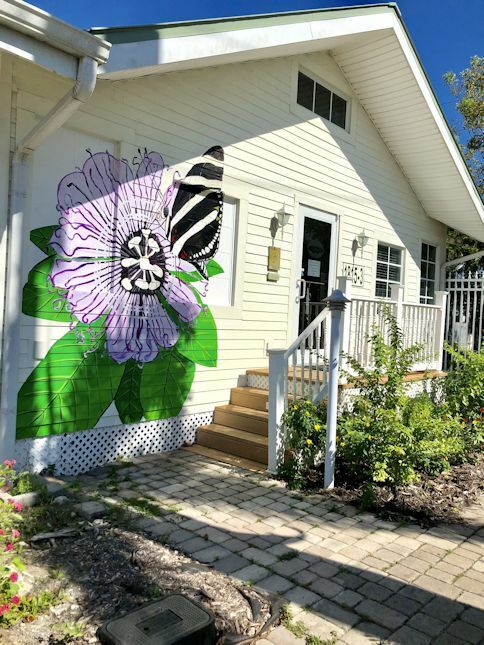 DAAS CO-OP Art Gallery & Gifts’ first exhibit at its new location at The Butterfly Estates is a group show appropriately entitled “A New Beginning.” It features the art of gallery members, some of whom have been a part of the project since it opened its doors in 2016 at DAAS’ former location. The exhibition will be on display through April 27. 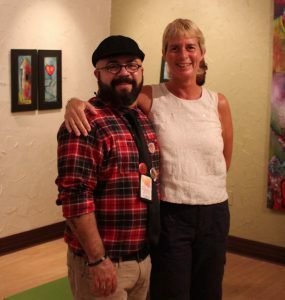 This event marks the third year of business for this cooperative gallery. 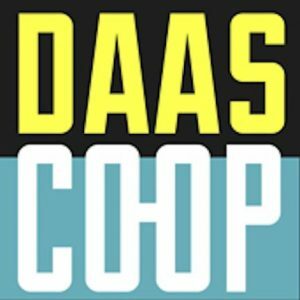 In April of 2016, visual artists David Acevedo and Xavier Brignoni founded the DAAS CO-OP in an effort to provide local artists a space where they could work as a team in a cooperative system. Since its inception, the gallery has won two awards and established itself as one of the main artistic venues of southwest Florida. “We had great years at the [former] location, but we feel like we belong here in now [in the Butterfly Estates],” says Acevedo, who sees the Gardner’s Park location (as the area is called) as an up-and-coming section of town. 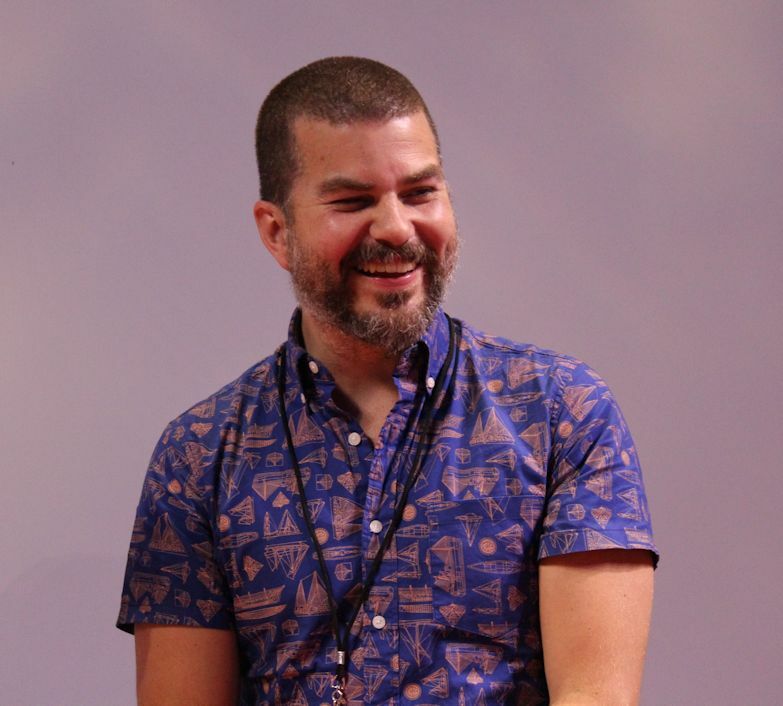 “As a cultural venue, we try our best to present our locally-made inventory in the most appealing way possible, thus representing the artistic community of Southwest Florida in the best way possible,” adds Acevedo, who directs and curates all the exhibitions for the space. DAAS CO-OP original space at Royal Palm Square had 2,400-square-feet of floor space, which allowed for ample ways to showcase the artworks, conduct classes, parties, etc. 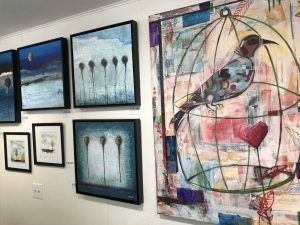 Even though the gallery’s new location is smaller at slightly over 1,500 square feet, the membership of the gallery is thrilled with the move. The new DAAS CO-OP is located at 1815 Fowler Street, Unit 3, in Fort Myers, FL (inside the Butterfly Estates campus). New business hours are Tuesday to Saturday, from 10:00 a.m. to 4:00 p.m. The gallery will open to the public on the first Sunday of every month from 10:00 a.m. to 3:00 p.m.
More information can be found at daascoop.com or by calling 239-590-8645. Florida SouthWestern State College is continuing its celebration of the Bob Rauschenberg Gallery’s 40th anniversary by presenting JOHN CAGE: STEPS & Other Works from the Mountain Lake Workshop. The exhibition features the world premiere of New River Rocks & Washes, one of the last two paintings Cage completed two years prior to his death in 1992. The painting was sold before it was ever exhibited to a private collector with a large and prestigious inventory of artworks. As it happened, the painting arrived, it was placed in storage still in its crate without being assigned an acquisition number. To make matters worse, the crate was mislabeled and, over the ensuing 27 years, the crate containing the 8.5 foot tall by 28 foot long painting was moved from one storage facility to another before coming to rest in Deer Park, New York. 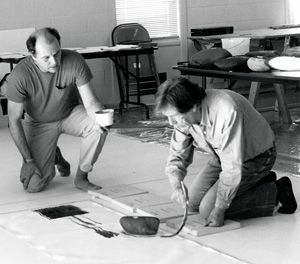 And that’s where it was when Ray Kass and Bob Rauschenberg Gallery Director Jade Dellinger started working on a planned exhibit of Cage’s collaborations with Kass, who had been present when Cage and a team of assistants created it at the Mountain Lake Workshop in 1990. 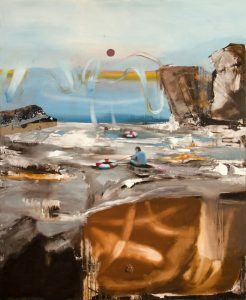 Kass and Dellinger contacted the collector’s chief curator hoping to include the painting in the show. 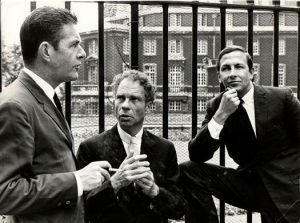 The curator ultimately found the mislabeled crate only a few weeks prior to opening of the Rauschenberg Gallery opening. One of the most influential American composers of the 20th century, Cage is perhaps best known for his 1952 composition “4’33”, a piece instructing the performer not to play their instrument during three timed movements over four minutes and thirty-three seconds. Cage proposed the revolutionary concepts that any sound may constitute music and that there is no such thing as silence. This exhibition is made possible through a partnership with the Longwood Center for Visual Art at Longwood University and presents excerpts from “Rural Avant-Garde: The Mountain Lake Experience” (an exhibition funded in part by the National Endowment for the Arts). 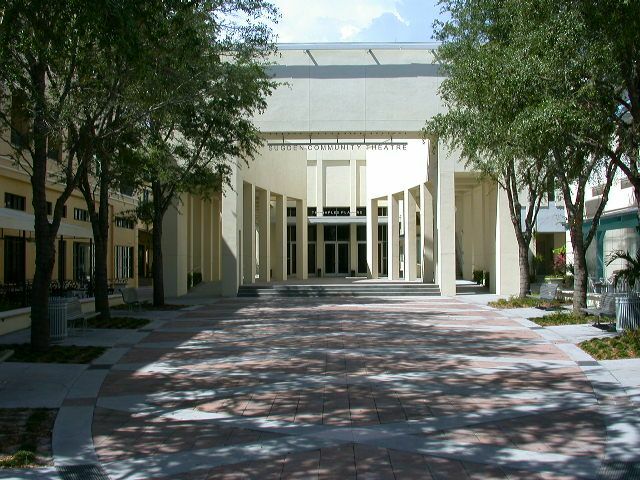 The Bob Rauschenberg Gallery is located on the Lee campus of Florida SouthWestern State College. Marcus Jansen’s work is being featured by New River Fine Art in Fort Lauderdale in an exhibit titled Merchants of Babylon. The show runs April 25 through May 25, 2019. 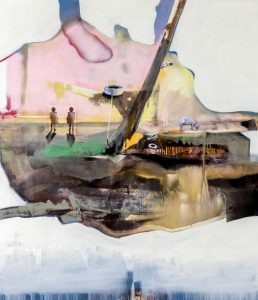 The exhibition includes 20 works of art created between 2011 – 2019. Jansen is no stranger to this type of chaos. 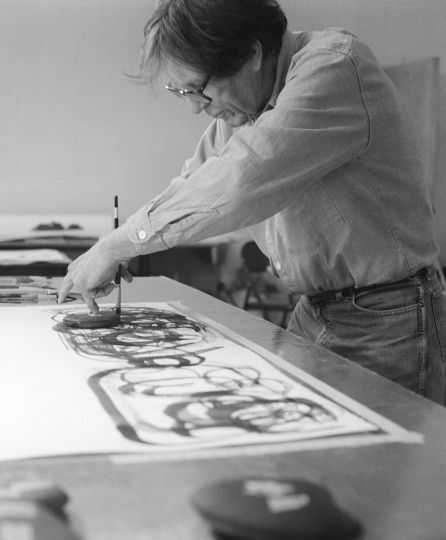 A veteran of Desert Storm and Desert Shield, he has seen the ravages of war first hand and the experience left an indelible mark on the artist and informs his work. Political or not, critics are hailing Marcus Jansen as one of the most important American painters of our generation. His socially-critical paintings and installations have been exhibited in museums in Italy, Germany and the United States. 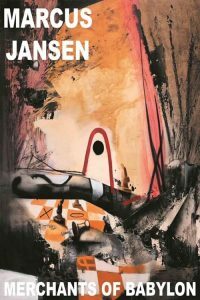 Jansen’s art is rooted in the New York Graffiti scene, but years spent in Germany garnered influence from the Expressionists to develop a language that speaks of a world in turmoil with isolation, threat, war, surveillance and greed in competition with innocence, hope and humanity. A full color exhibition catalog is available. 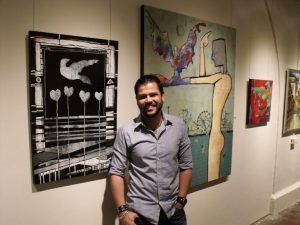 An opening reception for the artist will take place on April 25th at the gallery. 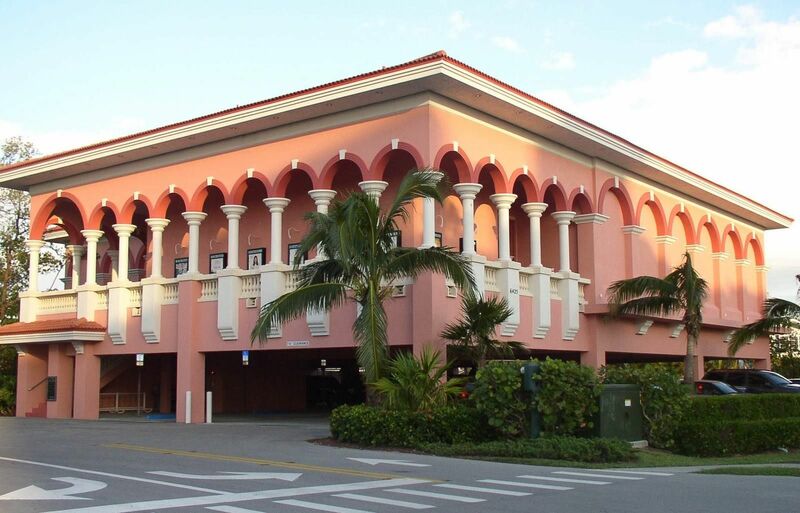 New River Fine Art is located at 822 East Las Olas Blvd in Ft. Lauderdale, FL. For more information, to schedule interviews with the artist or high-resolution images, please contact Lisa Burgess at (954) 524-2100 or lisa@newriverfineart.com or visit www.newriverfineart.com. Dr. Kyra Belan is known for her magical realism style of art. The Ceres Gallery in Manhattan, New York is exhibiting her drawings, paintings and mixed media work in a solo exhibition that runs now through April 27, 2019. Belan’s artworks are about social issues and two of her series will be exhibited during this show: the Lady Liberty Series, dealing with the current political issues,- particularly as they relate to women – and the Amazing Women Series, which celebrate the outstanding women that made or are making important contributions to our culture and politics. Her preoccupation with the latter subject stems from her realization that the percentage of portraiture that is dedicated to women of achievement is currently unacceptably small. Her goal, therefore, is to help correct this inequity by drawing attention to iconic women through her art. 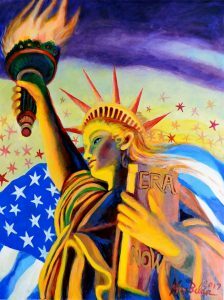 Ceres is a gallery dedicated to exposing feminist and social issue arts to the world through its visibility in the prestigious Chelsea Gallery District. 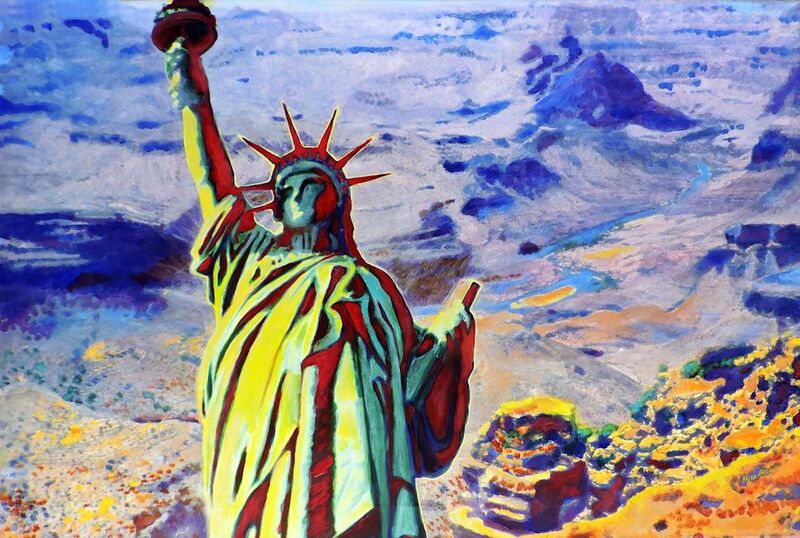 Dedicated to promoting women artists since 1984, it is the only such exhibition space in the city of New York. In addition to art, Belan is also an author, mythologist and art historian. She served as a professor of art and art history and a founding gallery director at Broward College for two decades. 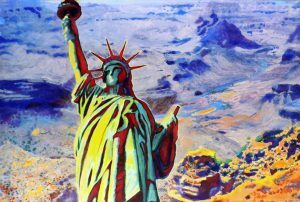 She has enjoyed more than 50 solo art exhibitions and numerous group shows. Go here to see all of Dr. Belan’s awards, accolades and achievements, as well as a list of the books she has published. For more information, please contact Director Stefany Benson at 212-947-6100.